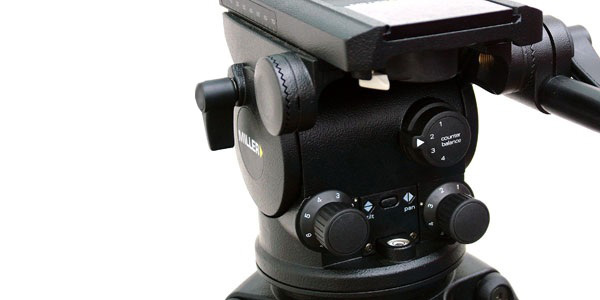 Equippe - Utleie av digitale filmkamera, pl-optikk, lys, studio og annet filmutstyr til din produksjon. 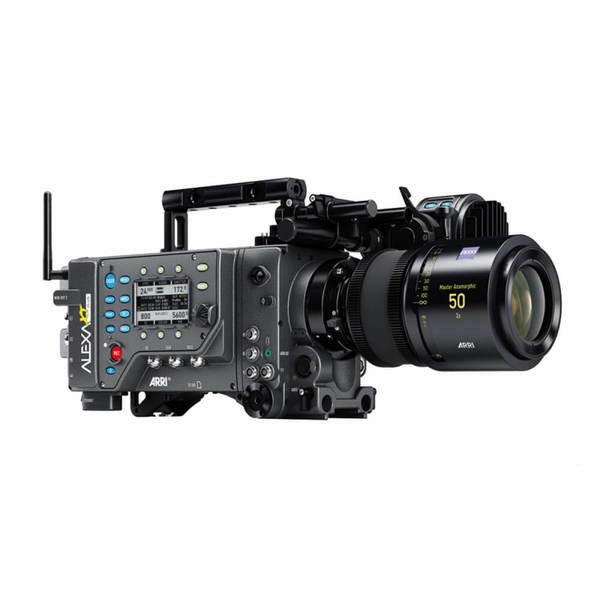 The ALEXA XT Plus is the most versatile and flexible of the ALEXA XT camera range, and thus a true allrounder. 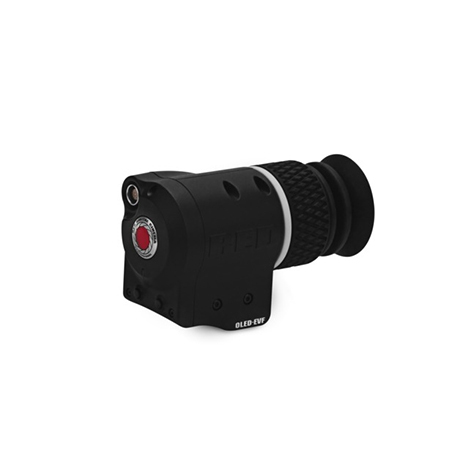 With an integrated wireless receiver for camera and lens remote control, built-in tilt and roll sensors and additional connectors for camera and lens control, signal output and accessory power supply, the ALEXA XT Plus offers the best value for anyone who can live without an optical viewfinder. 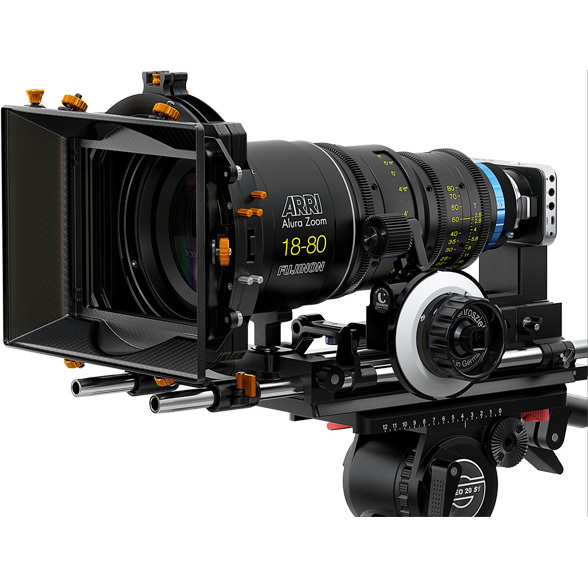 Like all ALEXA XT cameras it has in-camera ARRIRAW recording, internal ND filtration, a 4:3 Super 35 sensor, Open Gate sensor mode, integrated CDL capture, LDS PL mount, new viewfinder mounting bracket, included anamorphic de-squeeze and high speed licenses as well as a new, super silent fan. 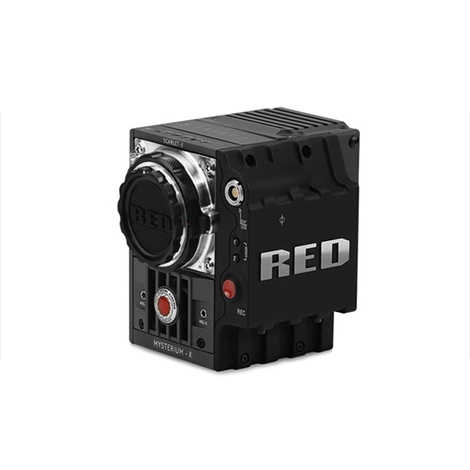 With the ALEXA 4:3 cameras, the full area of the sensor is used and a much higher image quality retained. 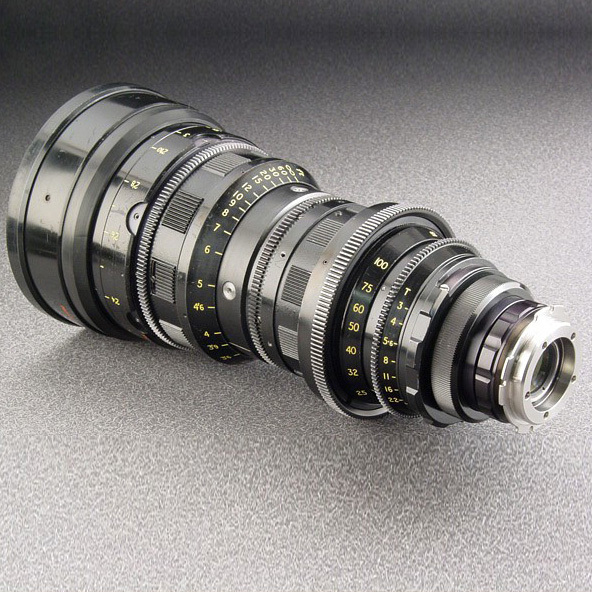 In addition, the unique optical characteristics of anamorphic lenses – the magic at the heart of anamorphic cinematography – are rendered faithfully and fully in the digital image. 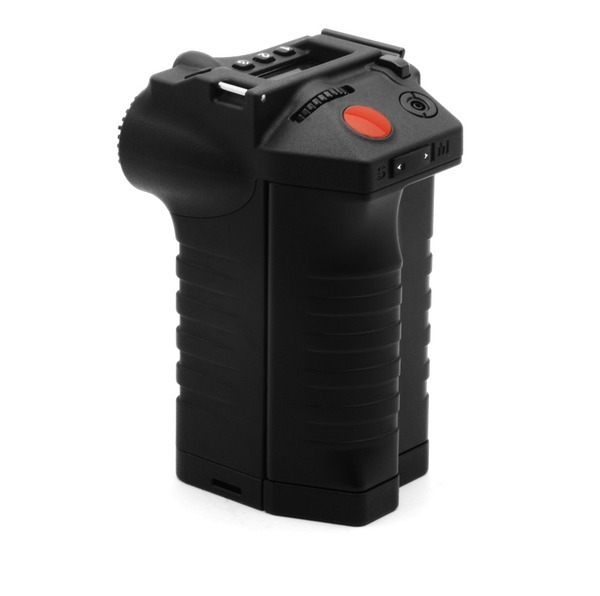 The BlackMagic Pocket Cinema Camera is a pocket sized Super 16 digital film camera that's small enough to keep with you at all times. 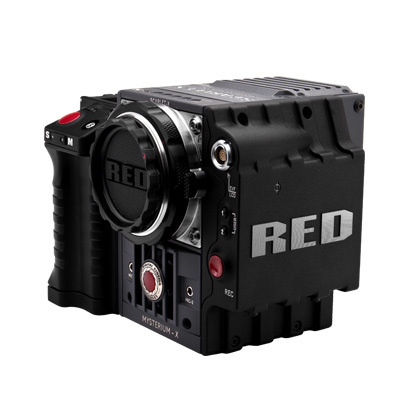 Get true digital film images with 13 stops of dynamic range, Super 16 sensor size, high quality lossless CinemaDNG RAW and Apple ProRes recording and the flexibility of an active Micro Four Thirds lens mount or PL cinema lens mount. All packed into an incredibly tiny size! 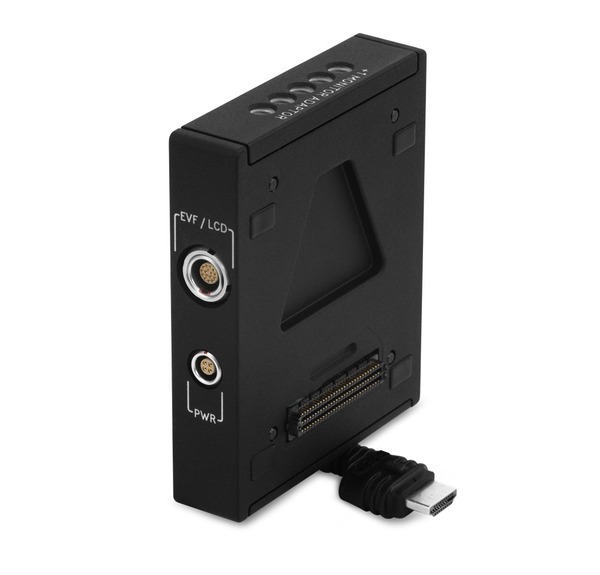 The Blackmagic Pocket Cinema Camera records 1080HD resolution ProRes 422 HQ files direct to fast SD cards, so you can immediately edit or color correct your media on your laptop. 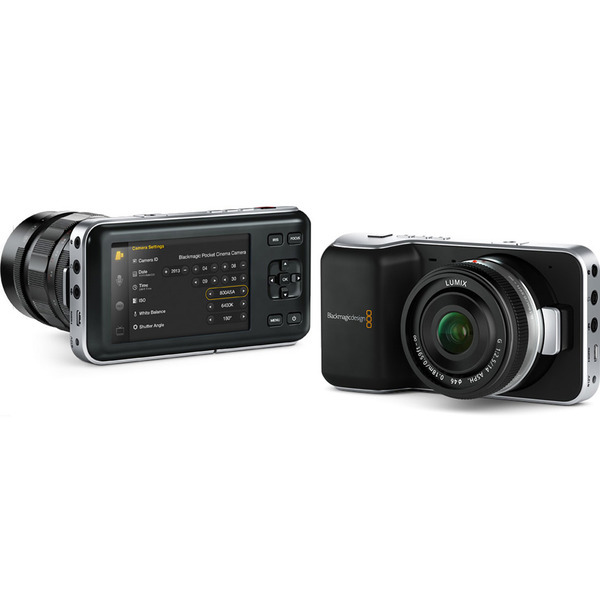 Blackmagic Pocket Cinema Camera is everything you need to bring cinematic film look shooting to the most difficult and remote locations, perfect for documentaries, independent films, photo journalism, music festivals, ENG, protest marches and even war zones. 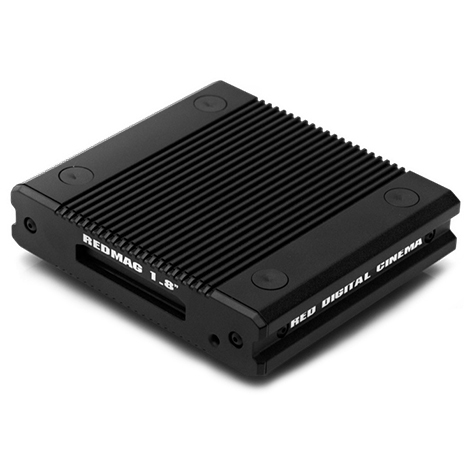 With a similar form factor of the Red Epic, the Scarlet is fully compatible with the Epic, both in terms of image quality and accesories. 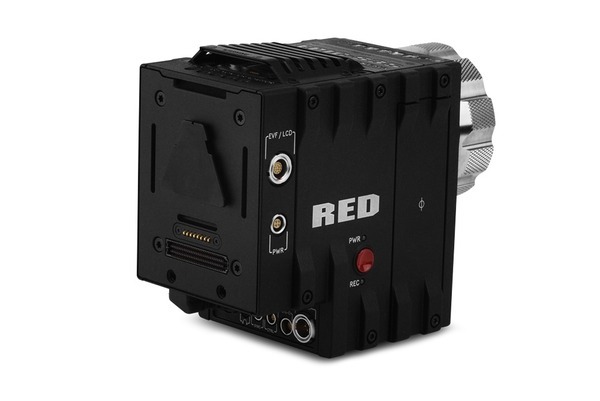 The mayor difference to the Epic is less processing power and bandwith within the camera body, resulting in lack of slow motion capabilities, HDRx and the use of the full sensor area in motion mode (at more than 12 fps, the Scarlet is limited to a 4k area of the 5k sensor). 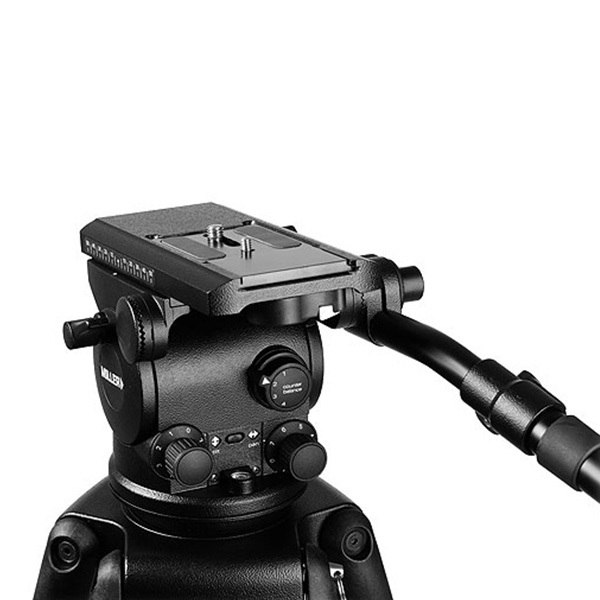 The +1 ADAPTOR MODULE mounts onto the back of a DSMC brain and features an extra EVF/LCD port for adding an additional RED display. 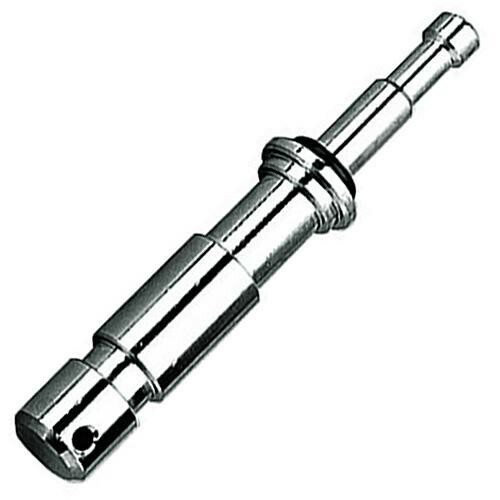 Also included is an AUX power port for 4-pin or 2-pin 3rd party accessories. 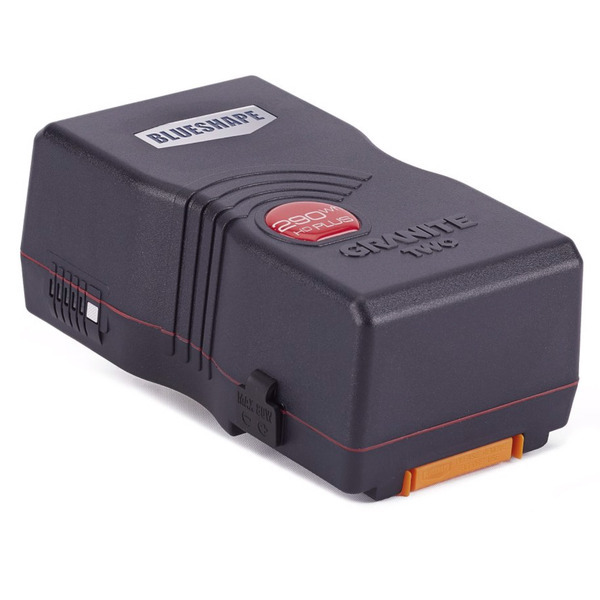 DSMC Battery Belt Clip provides a portable power solution for lightweight hand-held configurations. 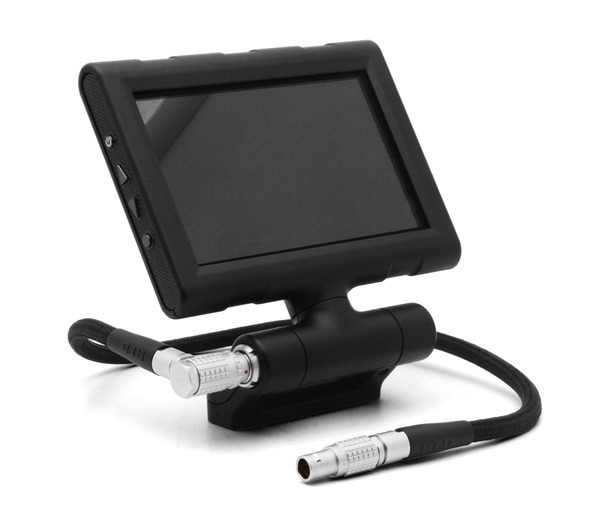 The attached 1B power cable plugs directly into an EPIC or SCARLET camera. 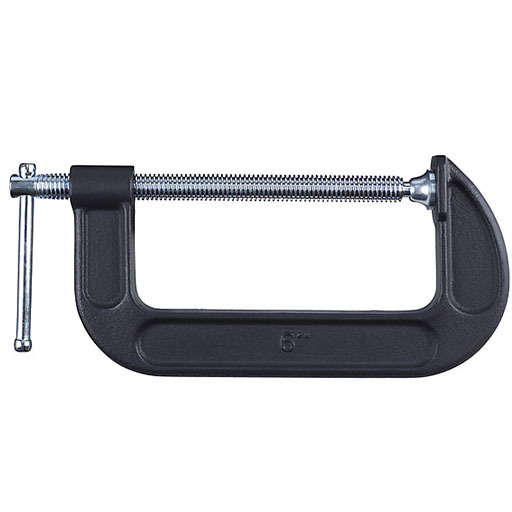 Clips directly onto belt. 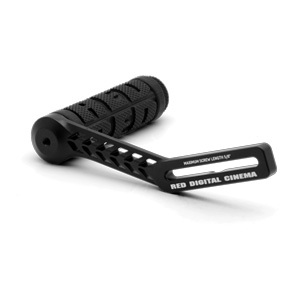 A fixed handle perfect to mount on a EPIC or SCARLET to create a rigid hand-held configuration. 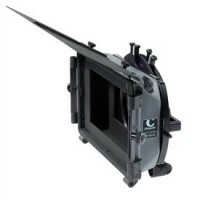 It makes for a perfectly balanced camera together with the battery grip on right hand side. 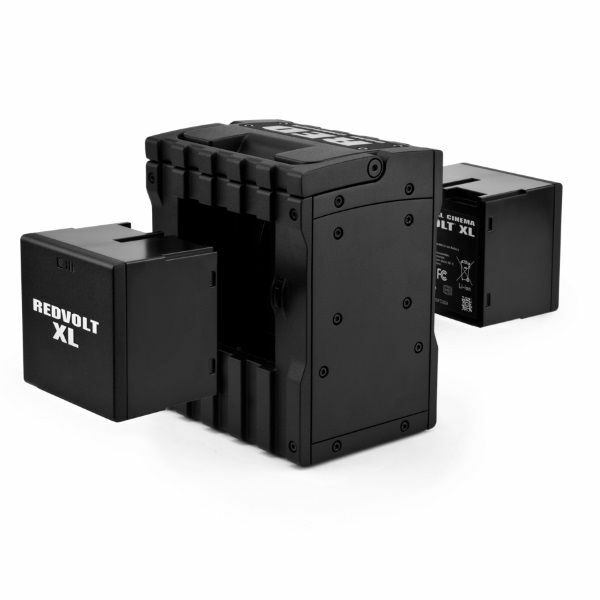 The Pro Battery Module (quad) harnesses the energy from four RedVolt batteries, or two RedVolt XL to power the Epic and Scarlet cameras. 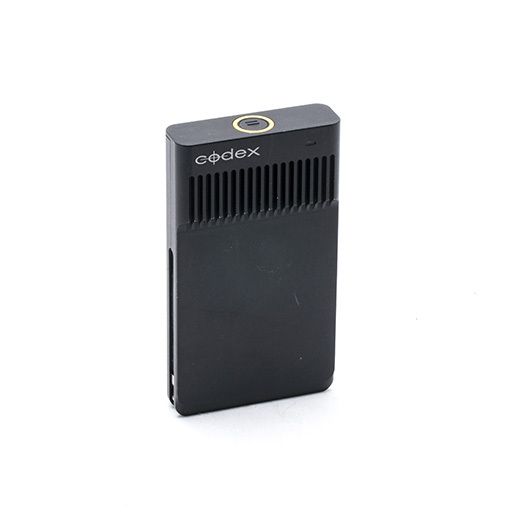 With the ability to hot-swap batteries on the fly, the can continuously power the camera. 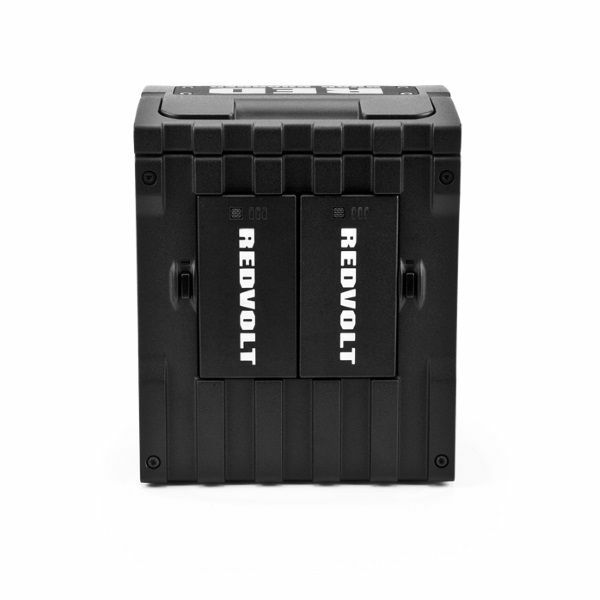 In combination with the Clutch shoulder solution, the Quad Battery module makes an Epic or Scarlet brain into a robust traditional shoulder camera without any lose cables, and wth a control panel on the back (RedMote). 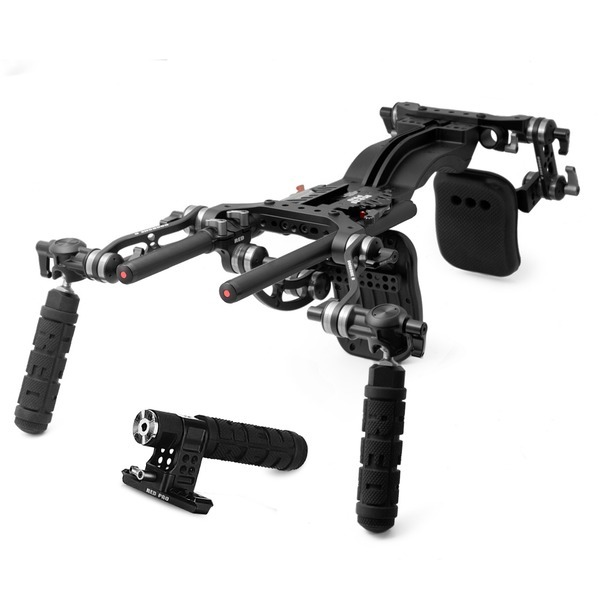 Designed by RED to provide the lightest and most compact shooting configuration, the DSMC Quick Release Platform Pack lets you mount an Epic or Scarlet to 19mm or 15mm rods. 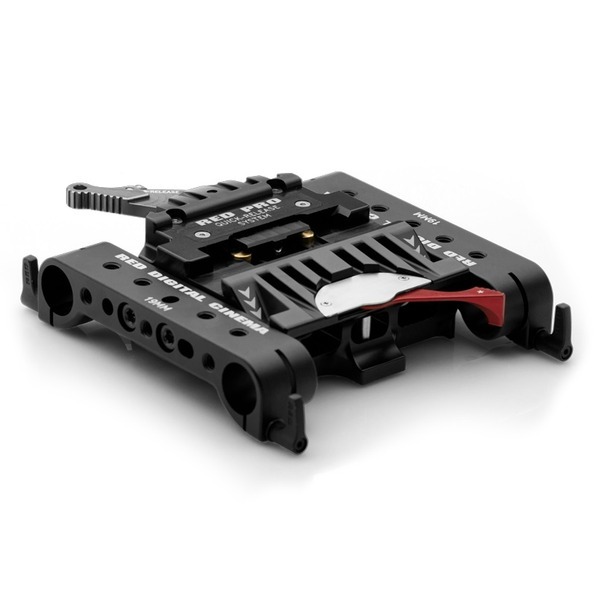 The Quick Release Platform will mount directly on an ARRI head or on a standard tripod head with the included dovetail mounting plate. 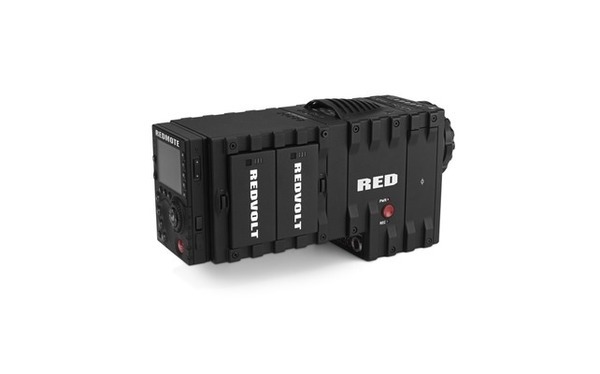 The primary benefit of the quick release platform pack is however, the ability to seperate a Red DSMC camera brain (Epic or Scarlet) from a full cinema-rig in seconds, to preform ultra compact hand held shooting, opening new creative cinematography possibilities not available with any other digital or analog cinema camera! 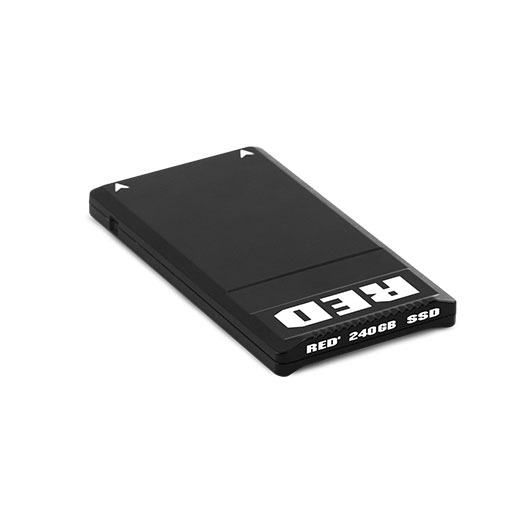 RED has always taken its monitoring options very seriously, providing high resolution solutions for all it's cameras. 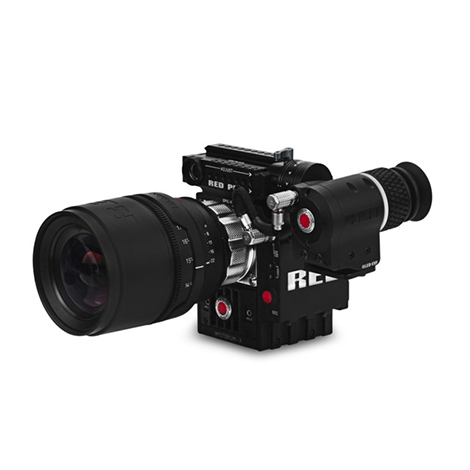 The RED PRO EVF - OLED is the high resolution viewfinder especially made for the DSMC-system, providing an elegant EVF for Scarlet and Epic. 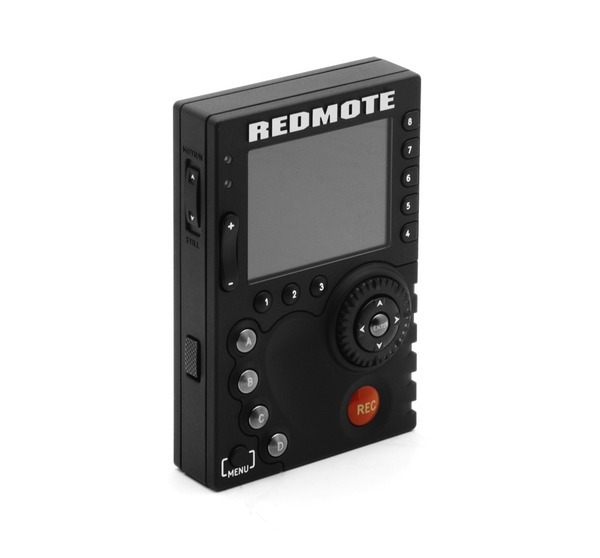 REDmote allows users to wirelessly navigate through menu settings and start/stop their DSMC® camera. 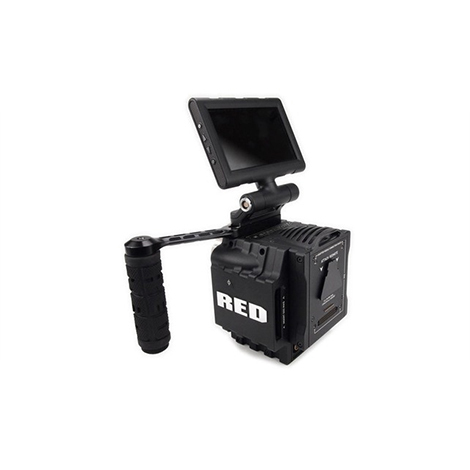 As the most convenient method for “grabbing” the camera, the new RED Sliding Top Handle has a rubberized grip and a clamp which attaches to the rail guide system, offering 15 mounting points, plus a rosette connection for additional accessory mounting. 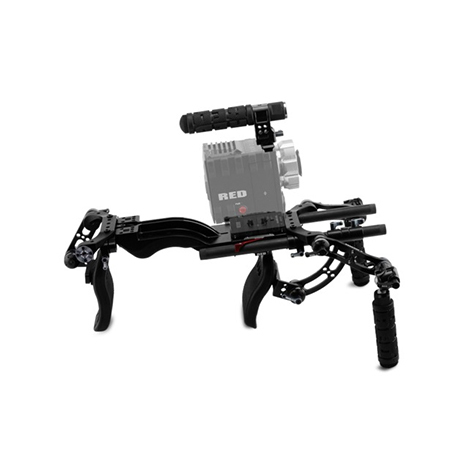 At the heart of RED’s new Rail Hardware System is a package that includes all components necessary for operating a RED camera on the shoulder. 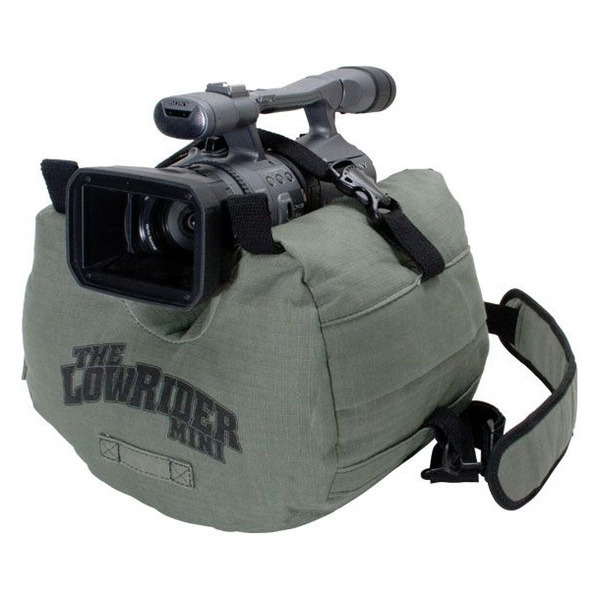 THE CLUTCH Shoulder Rig. 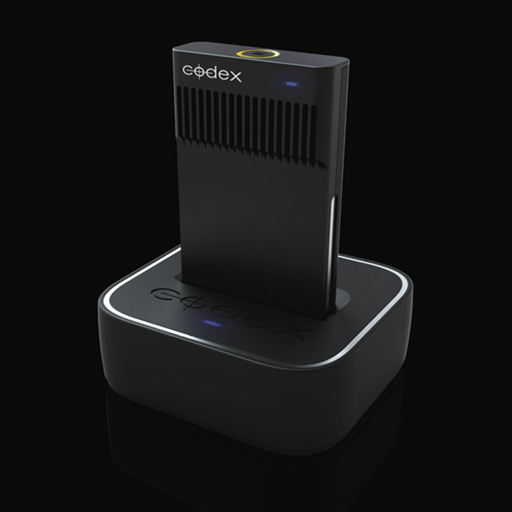 Ergonomic, flexible and highly innovative. 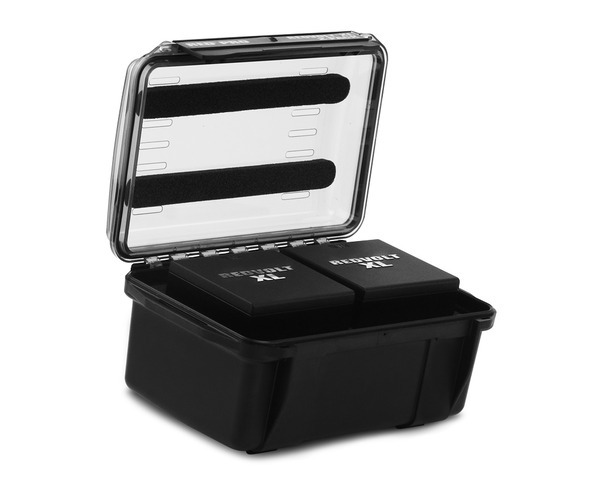 Designed exclusively for V-Lock Li-Ion batteries: charges 2 batteries in sequence. 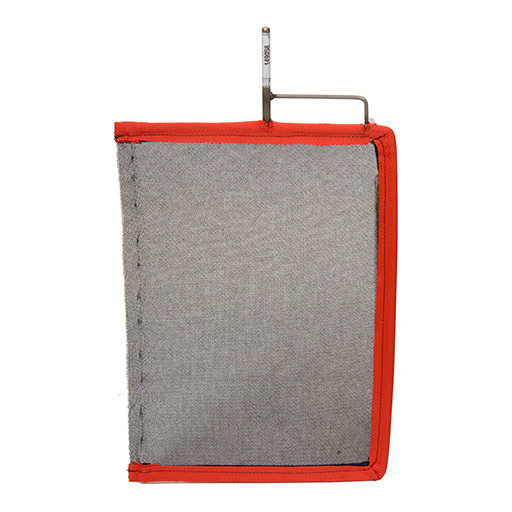 Compact size, easy to carry in bag, strong and robust assembly, ideal for travel. 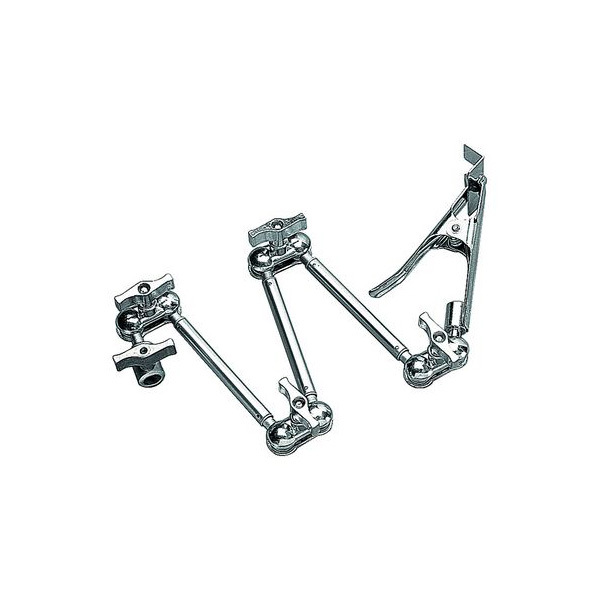 Rotating foot support increases stability and reduces bulkiness when not in use. 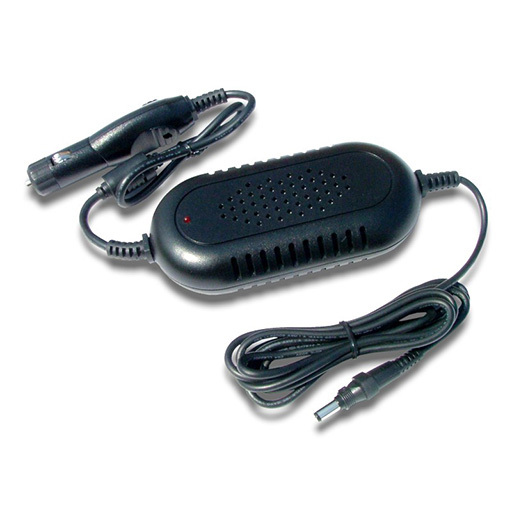 Can be powered either by AC or alternatively by DC: this feature makes the CVTR2 an ideal companion for On the road charge: it can alternatively be powered by the innovative, “In-car charge adapter “, PWCAR: Plug to the cigarette lighter socket and go. 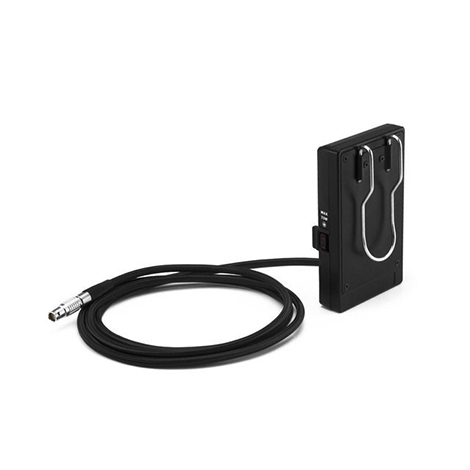 USB connection to interface the CVTR2 with computer: up to 4 chargers can be monitored by a single PC through BSCVMon. 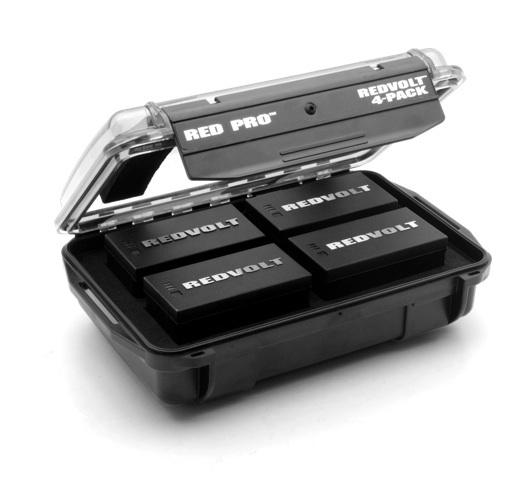 REDVolt (4-Pack) includes 4x REDVolt batteries, a charger and a custom waterproof case. 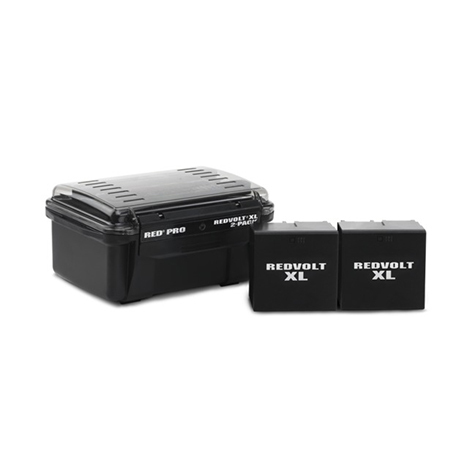 The REDVolt XL (2-Pack) includes 2x REDVolt XL batteries and a REDVolt XL water-resistant protective shell. 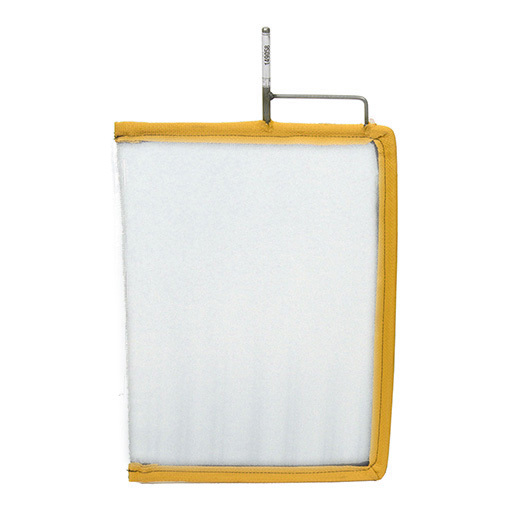 The 4 x 5.65" Low Contrast Filter 1/2 from Tiffen is valuable when the lighting ratio between highlight and shadow in your shot is too extreme for the medium you are working with to record. Normally, if you expose for the shadows, your highlights will blow out while if you expose for the highlights, your shadows will lose all detail. Low Contrast filters work by taking some light from your highlights and adding - sharing it with the shadowed areas of your shot. 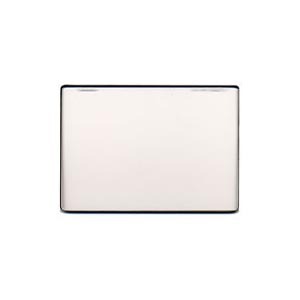 The bright areas of the image will remain bright while displaying minimal flare that, in some cases, may add mood to the overall image. 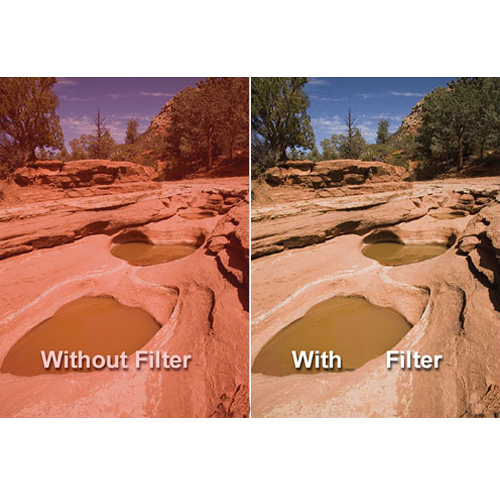 The resulting effect of this filter is that the dark areas become lighter with more visible detail. 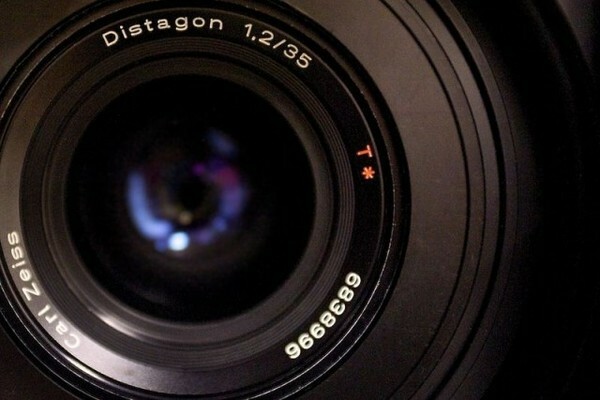 As there is no f-stop compensation required for use with this filter, you will not overexpose any portion of the image. 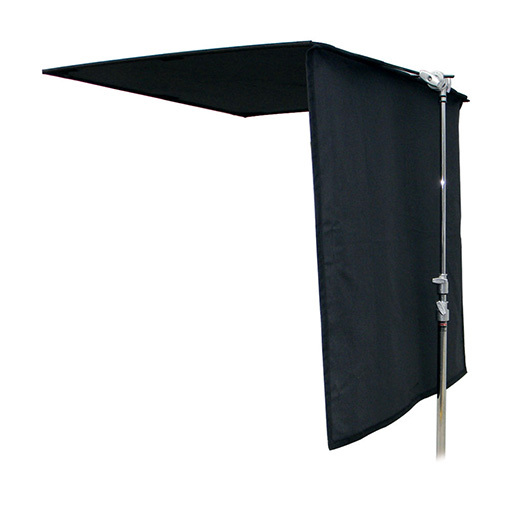 Examples for the use of a Low Contrast filter would be shooting under the covered porch of an old house or on a tree shaded country road where your model is in deep shade yet the surrounding venue is highlight-heavy. By adding more detail to the dark areas without blowing out your highlights, you achieve a more balanced, pleasing shot. 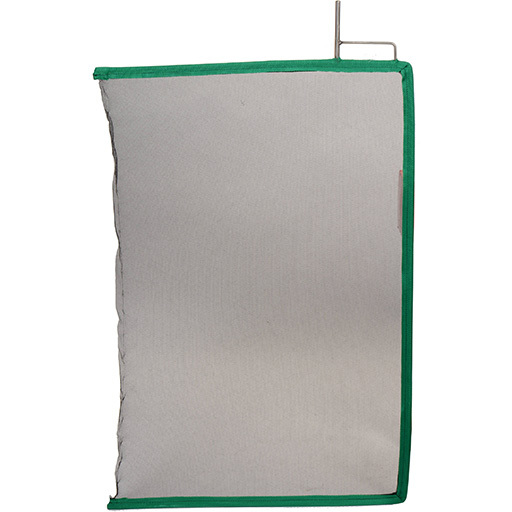 For people shooting video who prefer more of a traditional film look, this filter provides a workable solution. It should be noted that the Low Contrast filter differs from Tiffen's Ultra Contrast filter. Whereas the Low Contrast filter takes light from your highlights to open the shadows, the Ultra Contrast will take ambient light from the surrounding venue the shot is taken in and not just use the highlights within the frame. 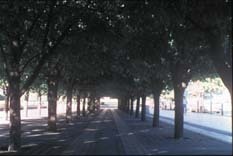 With a 1/2 Low Contrast filter, the shadows continue to open while your highlights remain bright with continued detail. 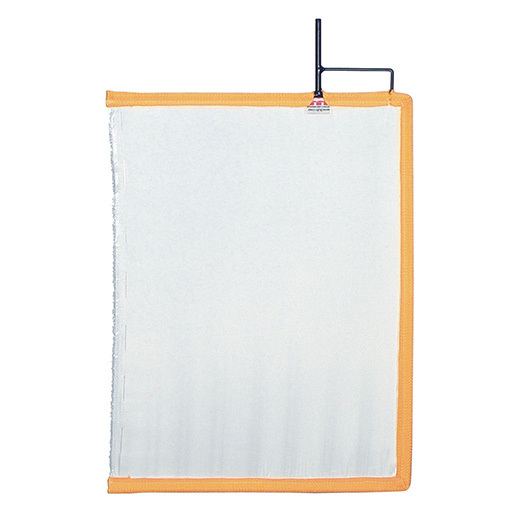 This is a Neutral Density Filter used for Cinematography. 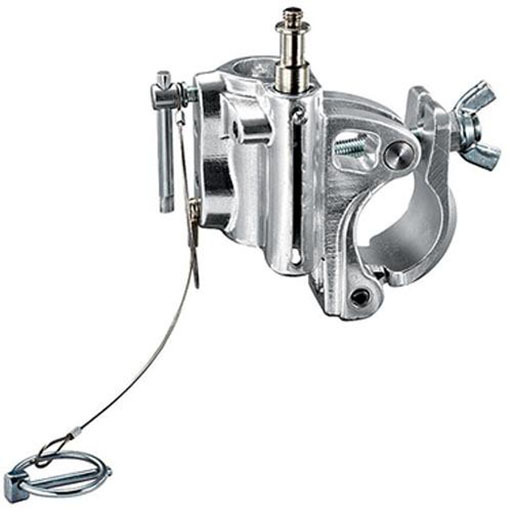 It has a Neutral Density of 0.3 (1 stop) and therefore reduces transmission by 50%. 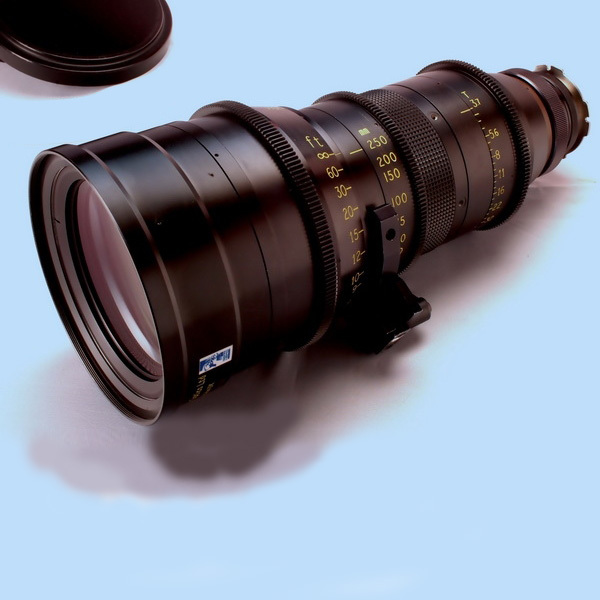 A common use for this filter is to allow the use of larger apertures, reducing depth of field, to allow selective focus and rack focus. 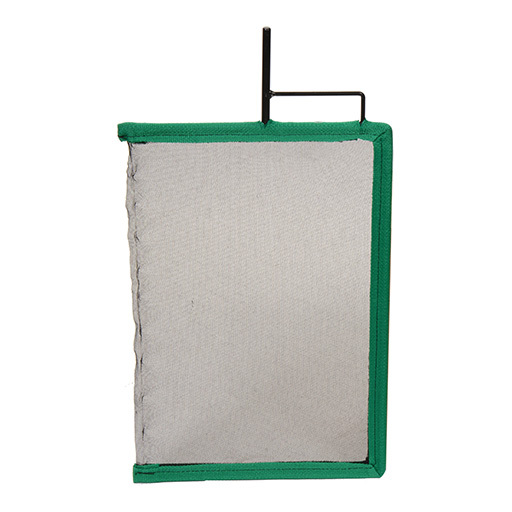 This is a Neutral Density Filter used for Cinematography. 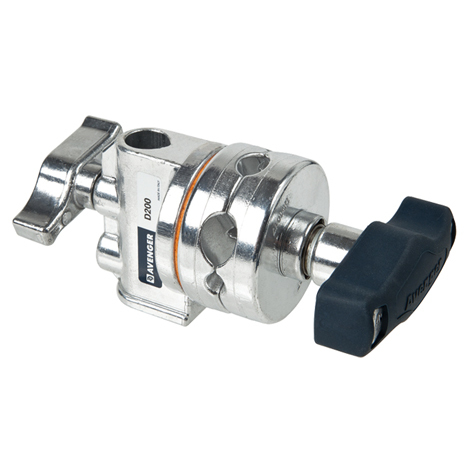 It has a Neutral Density of 1.2 (4 stops) and therefore reduces transmission by 94%. 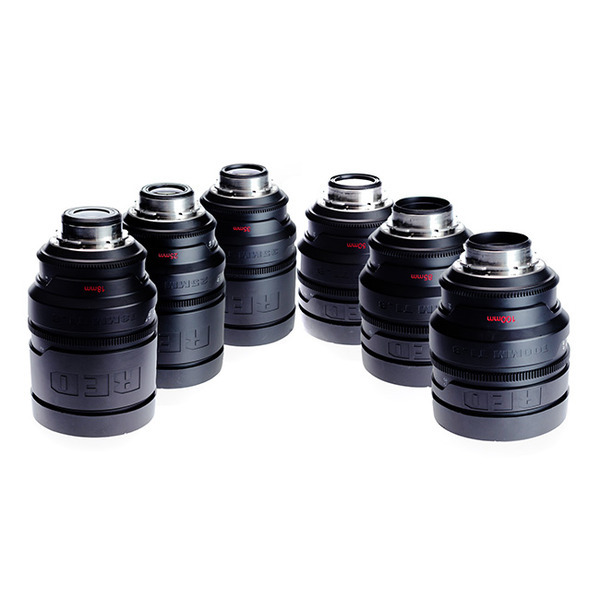 A common use for this filter is to allow the use of larger apertures, reducing depth of field, to allow selective focus and rack focus. 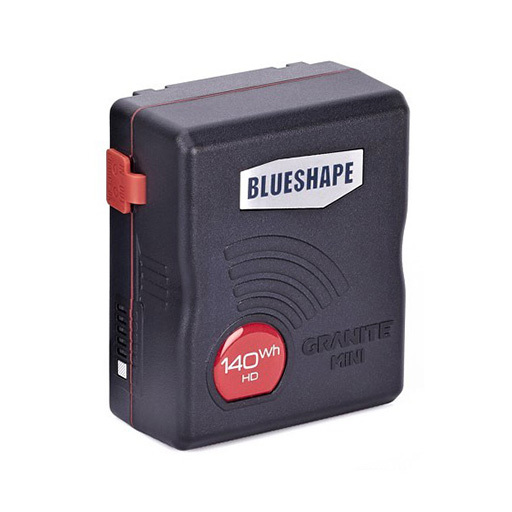 The 4 x 5.65" Low Contrast Filter 1 from Tiffen is valuable when the lighting ratio between highlight and shadow in your shot is too extreme for the medium you are working with to record. Normally, if you expose for the shadows, your highlights will blow out while if you expose for the highlights, your shadows will lose all detail. 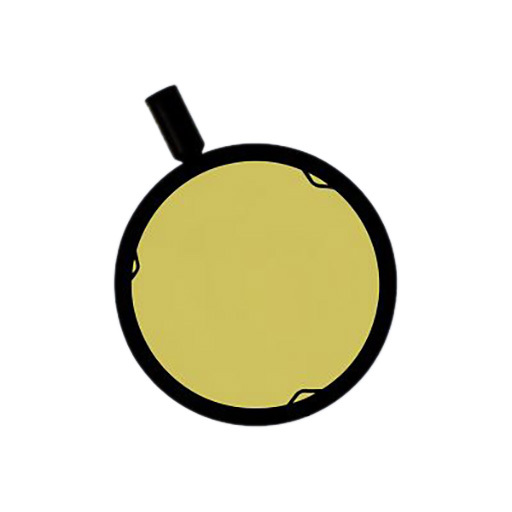 With a #1 Low Contrast filter, the shadows show even more detail than the 1/2 version while your highlights continue to hold their value with minimal flare generated. 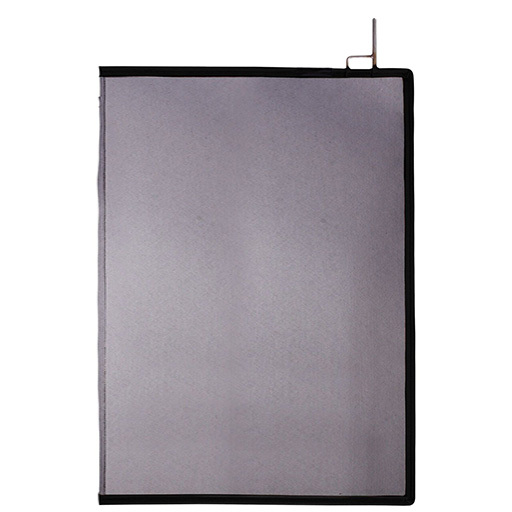 The Tiffen 4 x 5.65" T1 Infrared Filter is a high-tech filter targeted towards eliminating infrared contamination at 680nm. 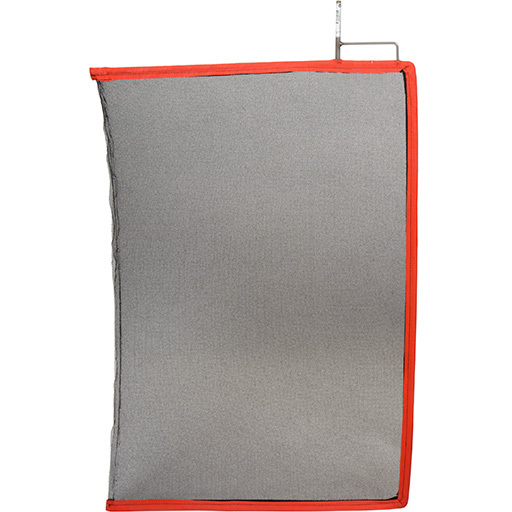 This filter will assist you in maintaining your color spectrum when shooting against a dark fabric. 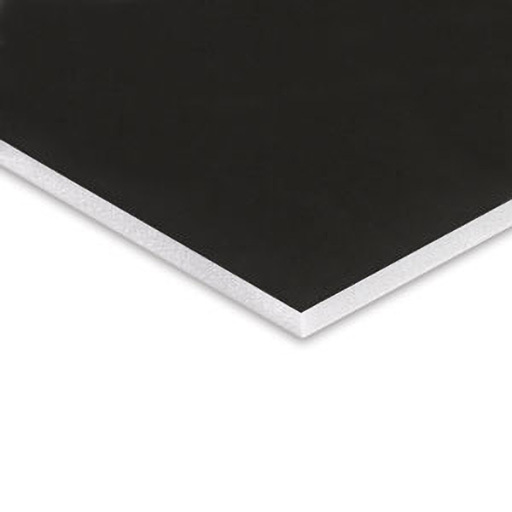 You will notice the blacks turn out true with no color cast from the red end of the spectrum. 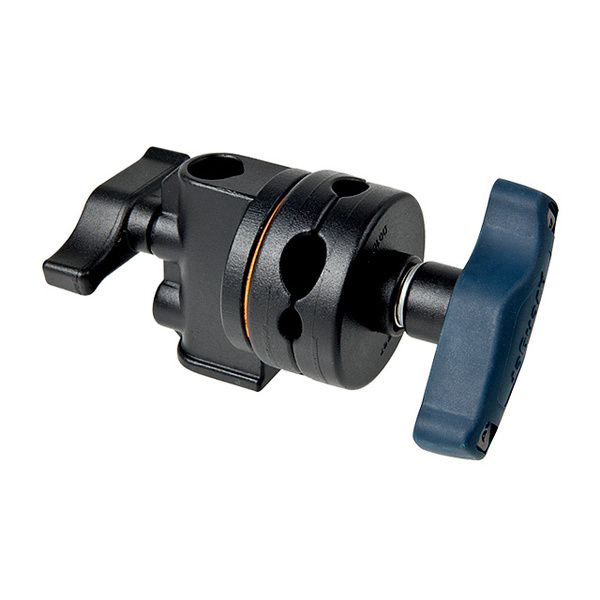 Manufactured in sleek black metal, this special edition of ARRI's ubiquitous studio follow focus unit combines a modern look with trusted engineering and a classic design. 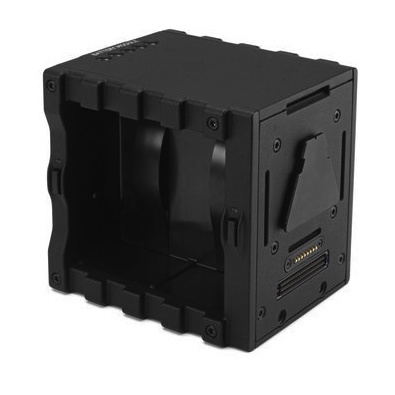 The Chrosziel MB450 R2 is a high quality compact MatteBox. 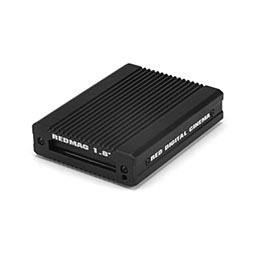 Compact form factor makes the RED STATION REDMAG 1.8" (Mini) perfect for offloading your REDMAG1.8" media when workspace is limited and portability makes all the difference. 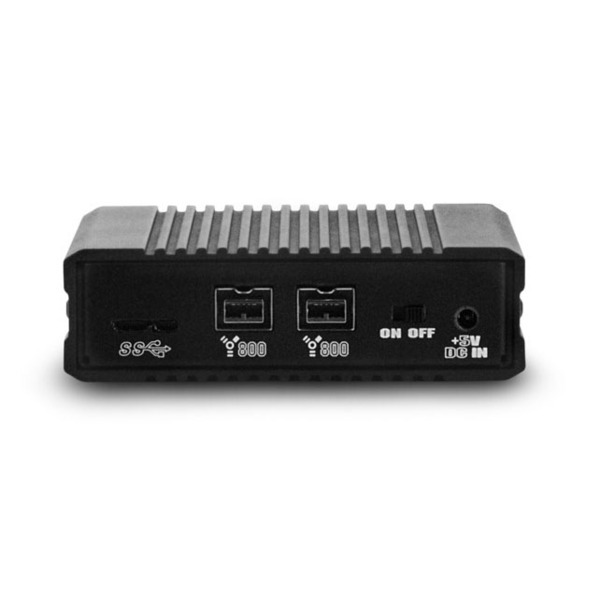 Connects using Firewire 800 or USB 3.0 ports. 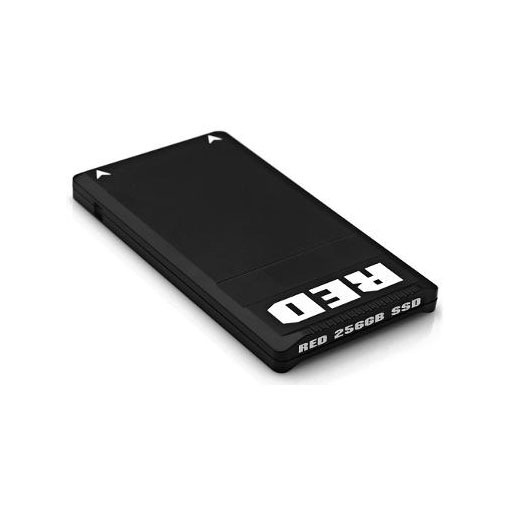 The RED STATION REDMAG 1.8" reads and offloads your REDMAG 1.8" SSD media onto your hard drive when connected to your computer. 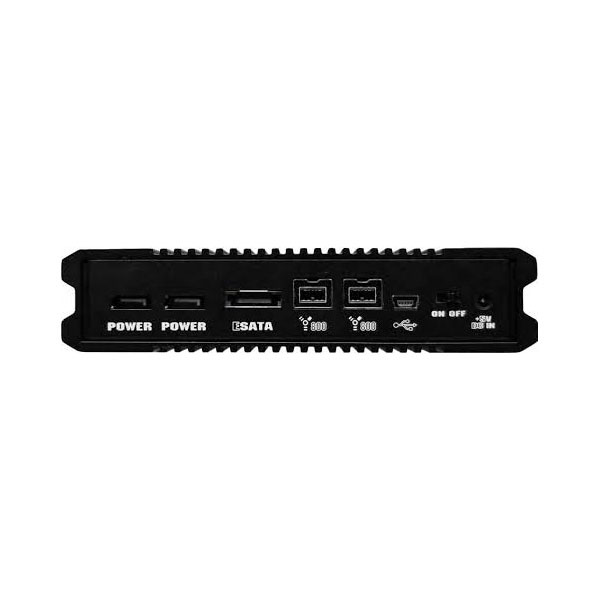 This product connects via eSATA, Firewire 800, or USB 2.0 to your laptop or desktop computer. 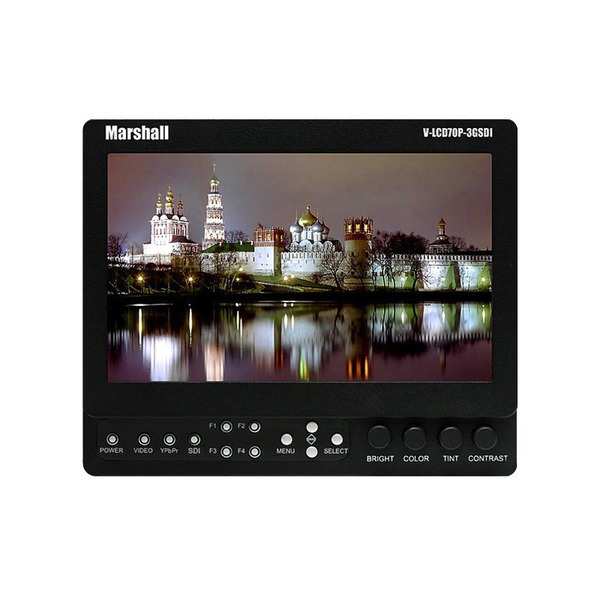 New SmartView HD features an amazing 17" LCD screen that lets you monitor SD, HD and 3Gb/s SDI video in full resolution HD (1080). 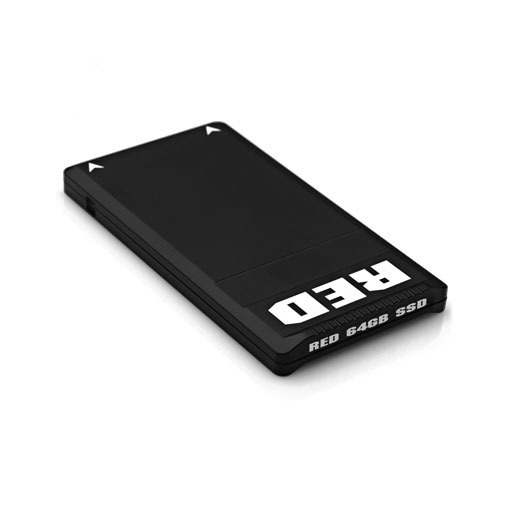 Just as impressive is its ultra slim design. 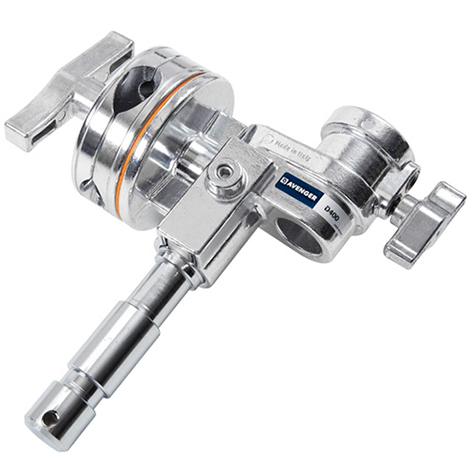 Only an inch thick, it’s the perfect size for all your SDI monitoring needs. 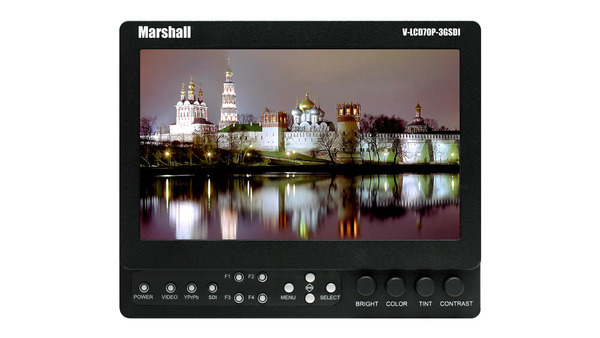 The Marshall 7" LCD monitor with 3G/HD/SDI and V-Clip Battery Mount is the latest update to Marshall Electronic's successful and popular line of portable field / camera-top monitors. 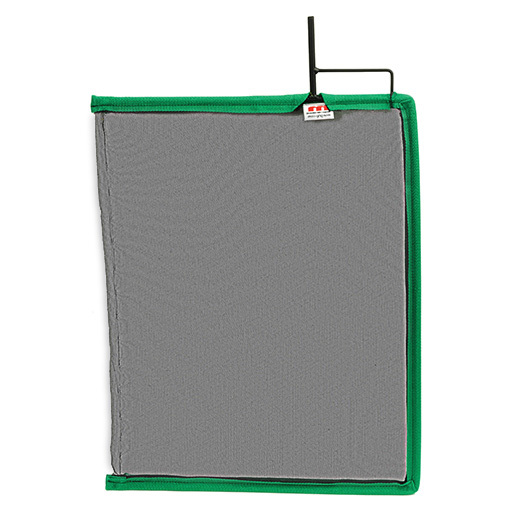 These monitors have been upgraded with even more features and versatility, but without additional cost. 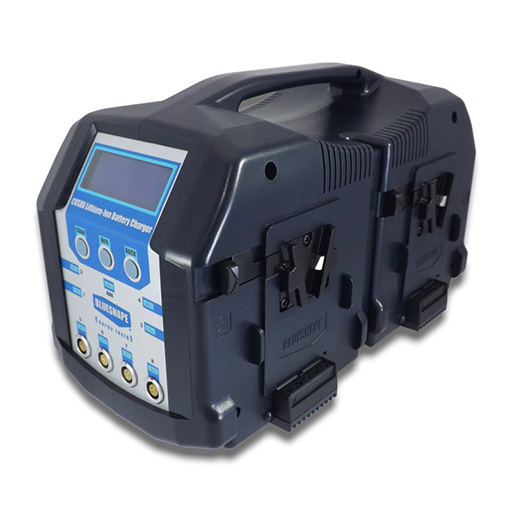 New features include cast metal front panel, adjustable backlight and markers, manual gamma adjustment, Image Flip, 1/4"-20 mounting on all sides, and a more robust power switch. 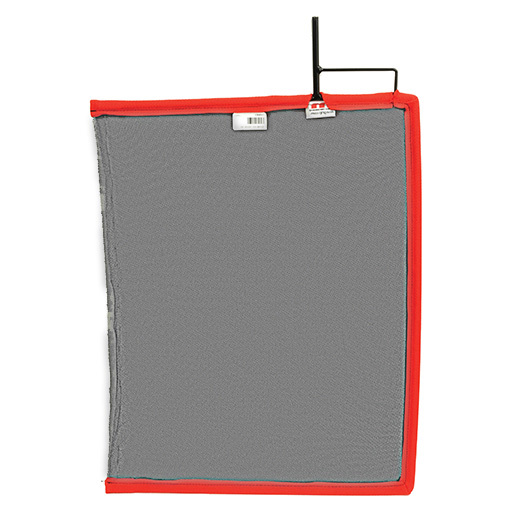 These new monitors continue to be durable, while retaining their lightweight design, weighing in at only 2 pounds. 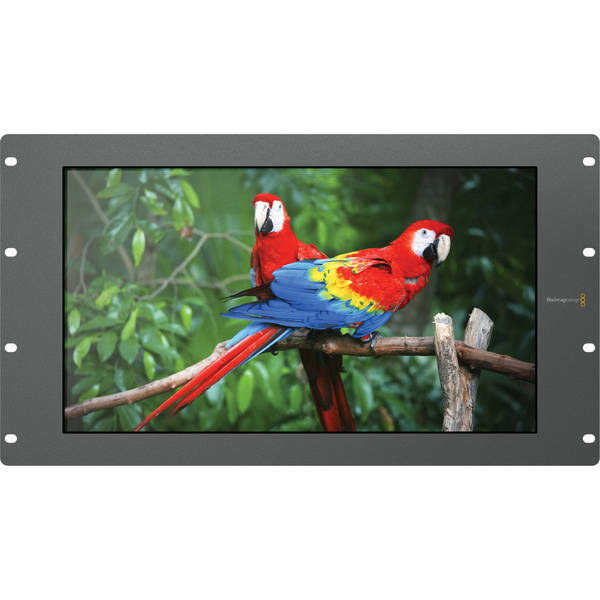 These monitors feature a completely digital TFT-MegaPixel high resolution LCD screen with 1.2 million pixels, 4-pin XLR power jack, and optical grade polycarbonate screen protection. 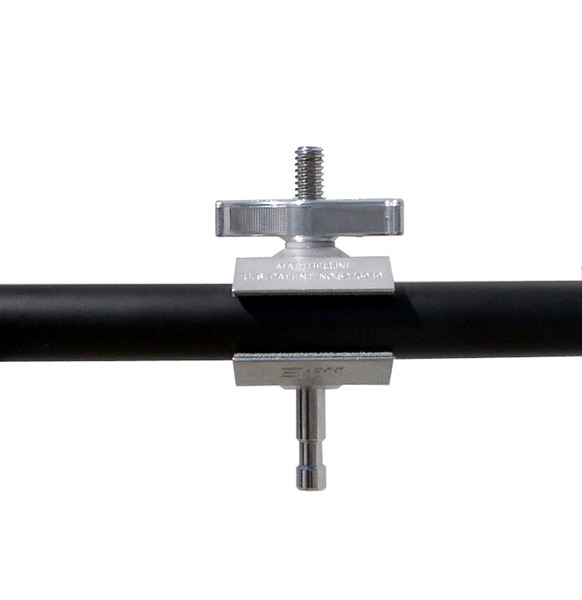 Analog signals are digitized using advanced 10-bit processing with 4x oversampling and adaptive 5-line comb filter. 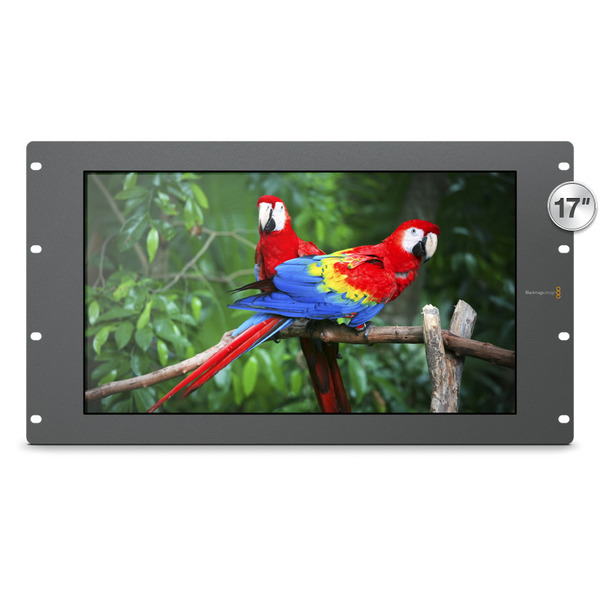 These portable monitors are the perfect solution for video professionals and DSLR users seeking to capture their best shots. 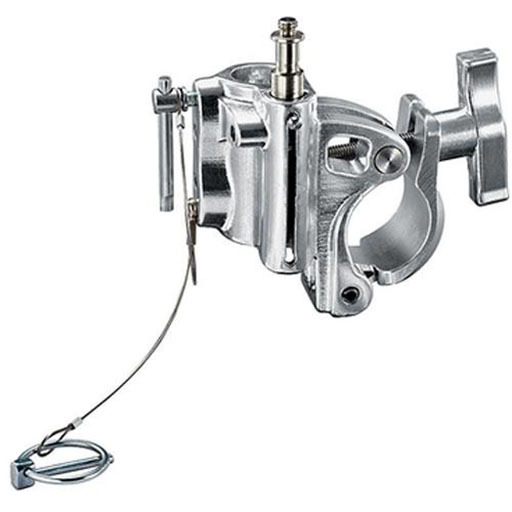 Marshall Monitors are Made in the U.S.A.
1 stage flip lock leg extension. 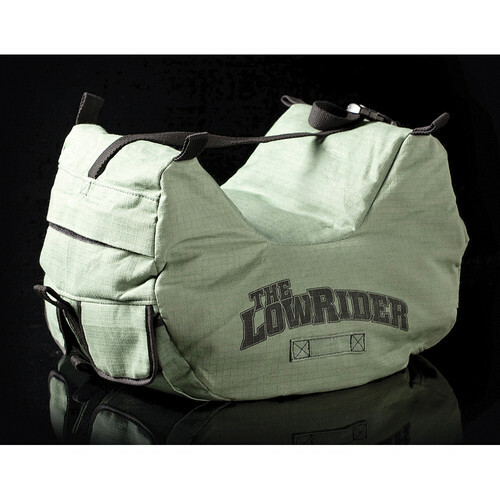 Suited for mid-level spreader (optional). 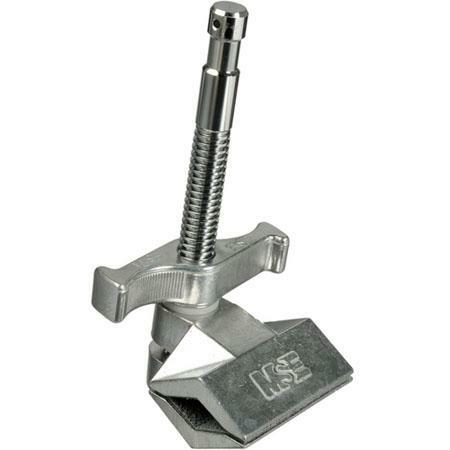 Integrated stainless steel foot spikes. 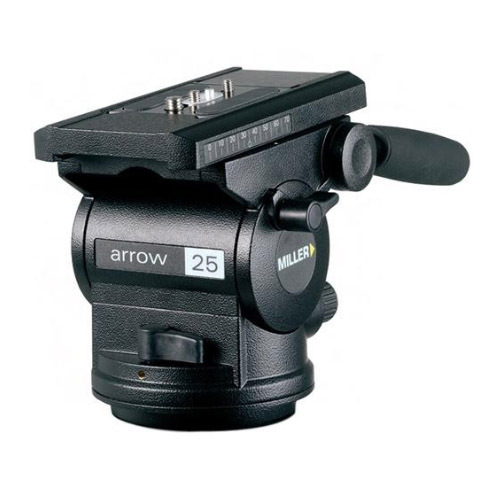 The Arrow 25 is a 100mm fluid head designed to support the latest generation in acquisition from the film-ready HD alternatives to lightweight ENG camcorders providing outstanding fluid drag performance. 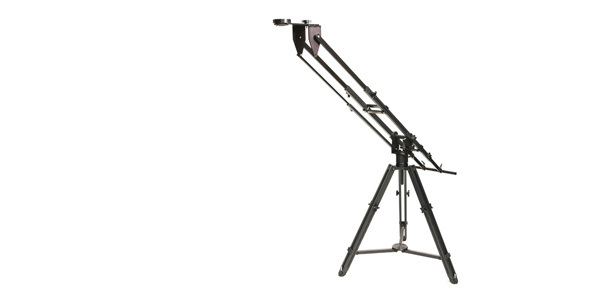 Arrow 25 features 5+5 selectable pan/tilt drag (plus'0') to provide repeatable light to heavy drag settings. 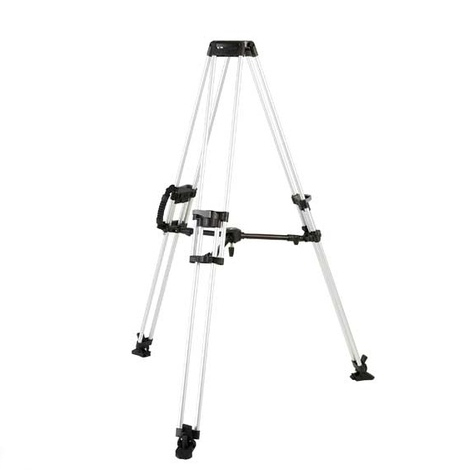 Selectable 4 position counterbalance and 70mm sliding camera platform to balance a wide range of camera loads from 3.5-14kg makes the Arrow 25 one of the most versatile camera support platforms available. 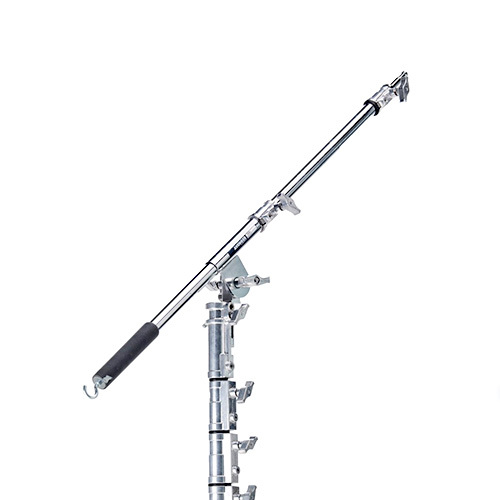 The Arrow 55 fluid head with 100mm sliding camera platform provides higher load capacity to suit documentary, lifestyle, HD productions and is particularly suited to long-lens applications or Cinema/Studio/EFP configurations. 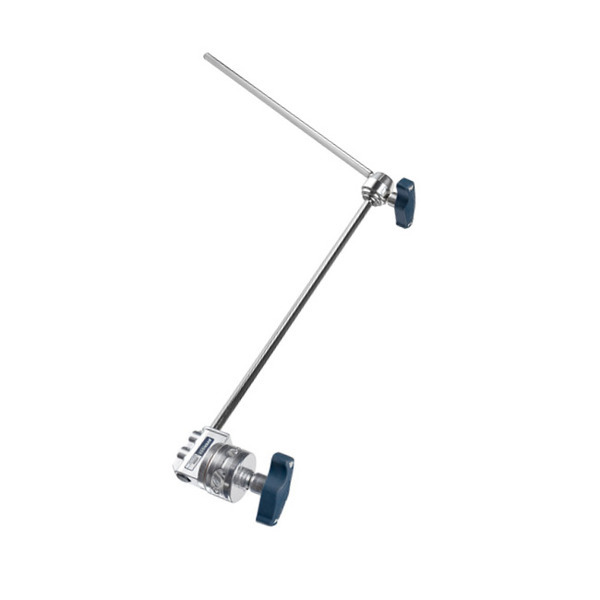 Coupled with widest range of pan and tilt drag, ideal for slow, heavy pans; the Arrow 55 is the heavy duty performer. 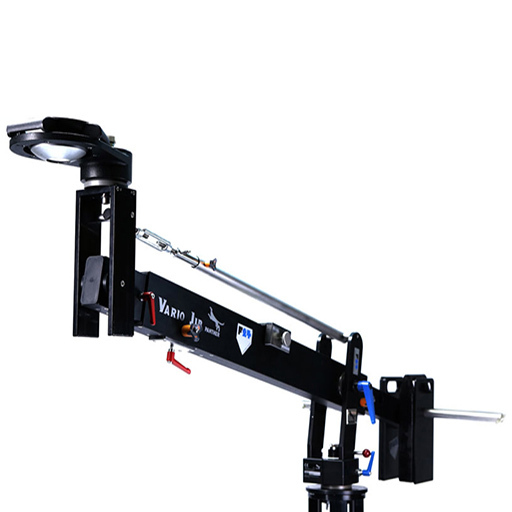 The unique Kessler Crane can be assembled in a variety of sizes and configurations. 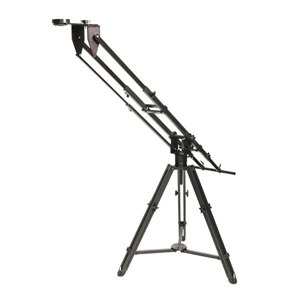 Telescopic arms on both sides make the Vario Jib a universal piece of equipment for many shots. 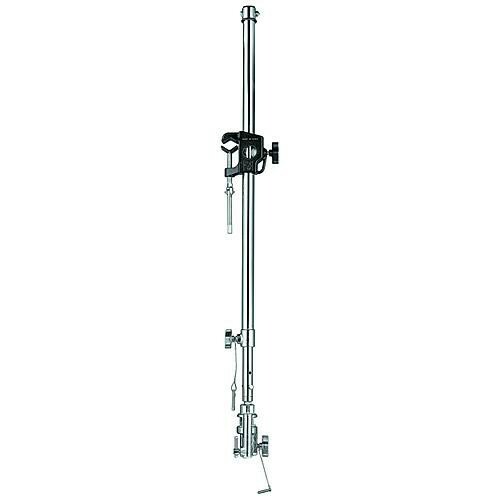 With an additional extension the Vario Jib can be extended by 1m. The max. 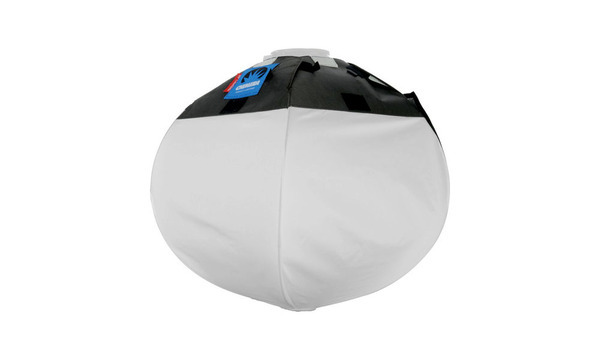 payload is 80kg / 176lbs., despite its compact design and weight of only 22kg / 48lbs. 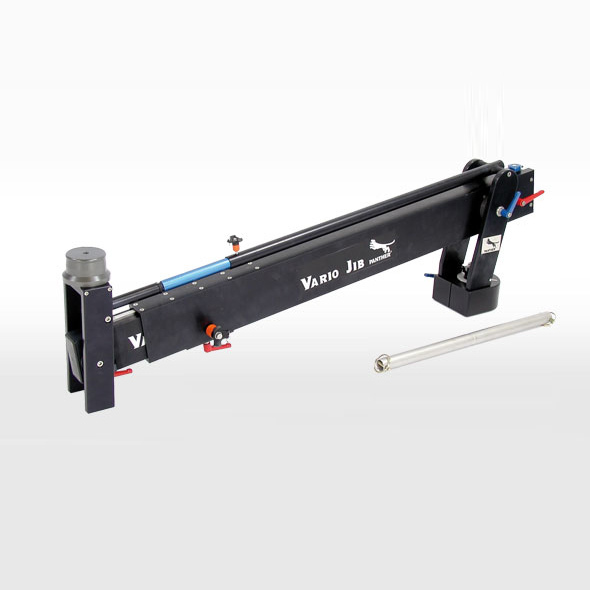 The Vario Jib can be operated manually or electrically. 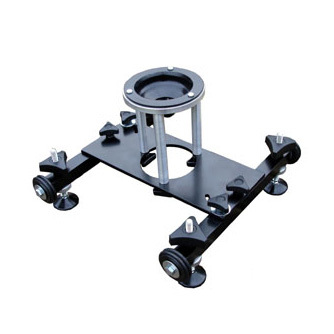 The ground platform or running board bracket offer enough space for operation. 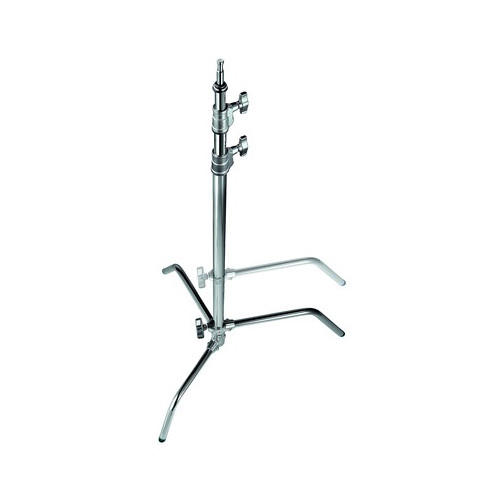 It can be mounted on any dolly. 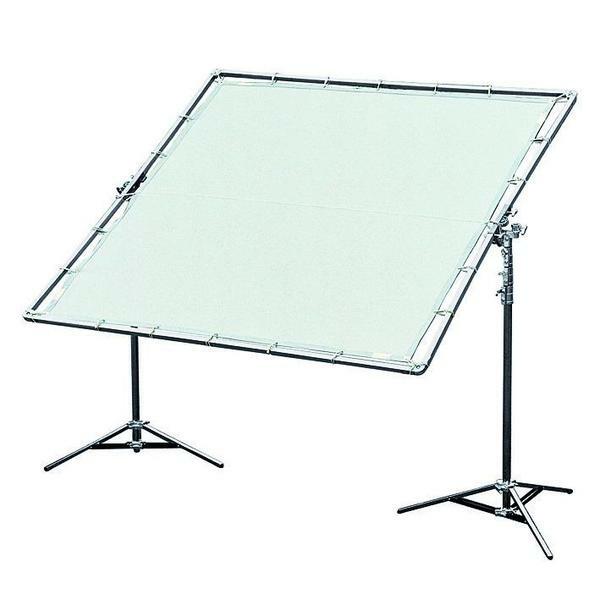 An ergonomic and easy handling as well as a quick set up facilitate your responsible job on set. 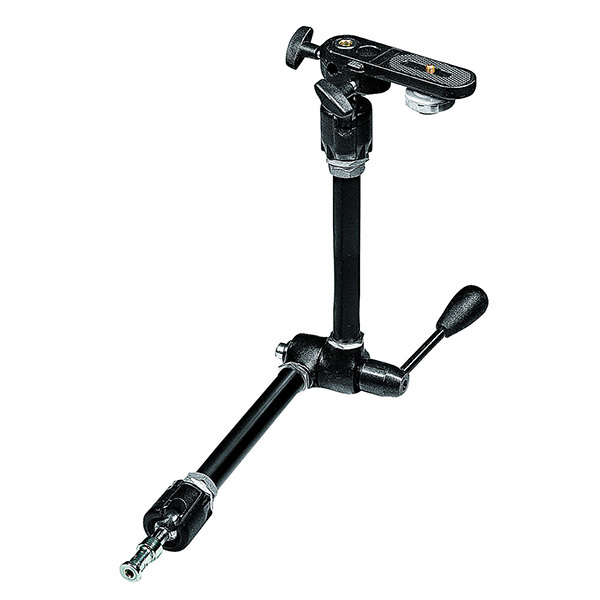 A pan and tilt brake with integrated friction comes with the Vario Jib. 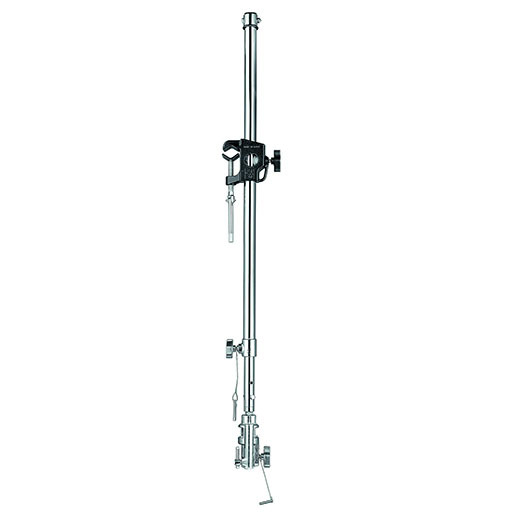 To find the right balance the Vario Jib is fitted with an additional sliding weight. 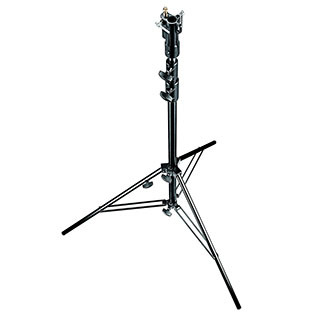 The Multi-Rig allows the adjustment of the Euromount in all possible angles. 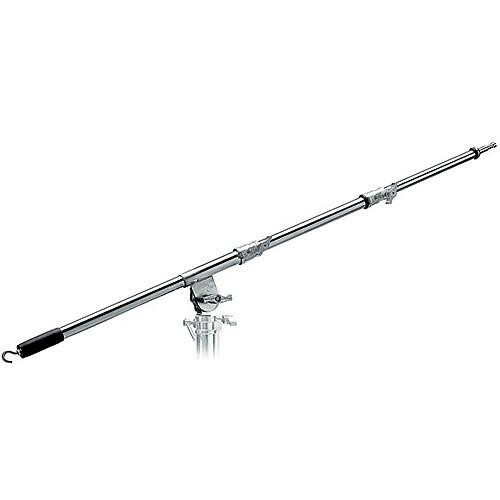 The Vario Jib can be combined with existing Panther accessories. 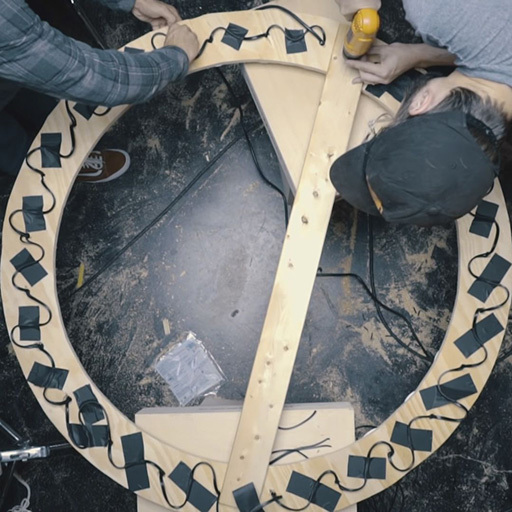 Cinevate's Dolly, "Ballare", uses a unique wheel system that can follow curved and non-parallel track. 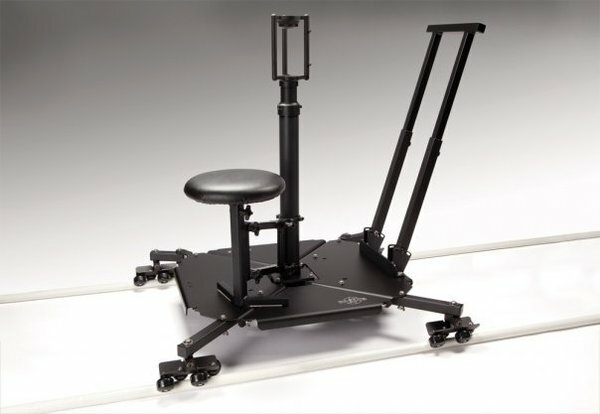 Designed to carry in excess of 250 kg, it features dual stance adjustment for use both with a jib (wide), or as a doorway dolly (narrow). 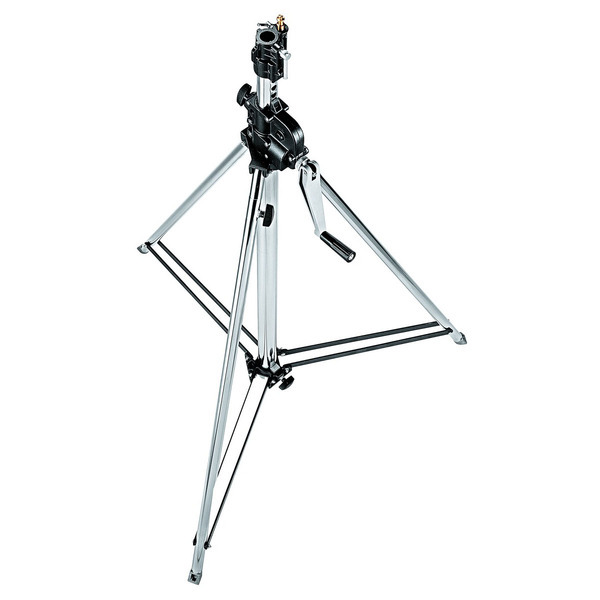 It is designed to support both a camera and a jib. 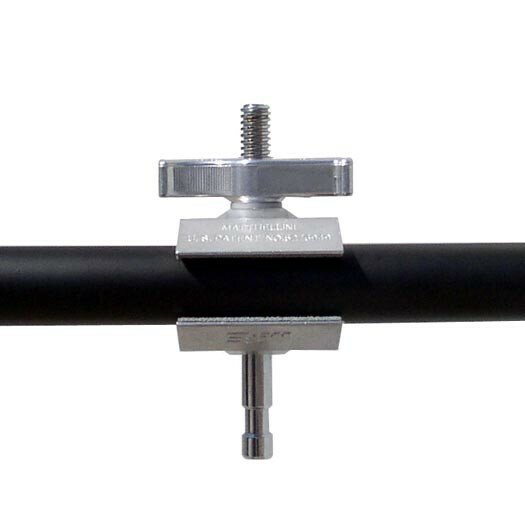 The dolly will ship with two pipe couplers to seamlessly join two 1" ID tubes together. 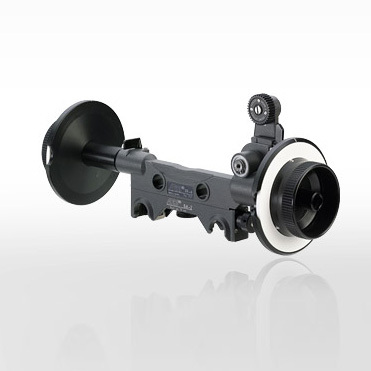 We use shedule 40, 25mm ID PVC pipe as it bends very nicely for use with curved setups. 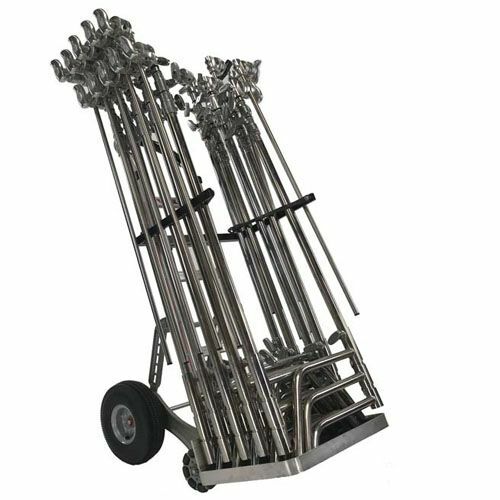 The Ladder Dolly will run on any aluminium ladder giving super smooth tracking shots. 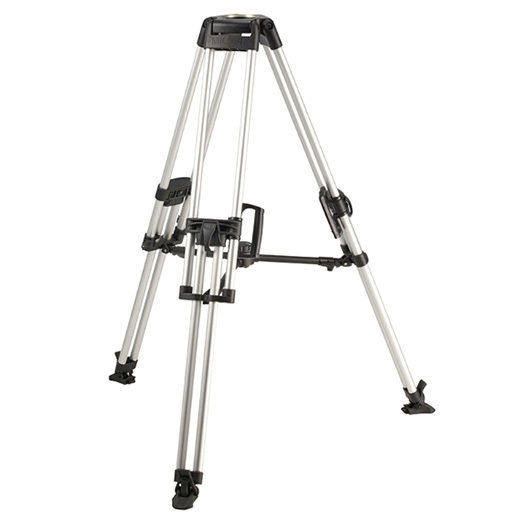 It has a 100mm bowl onto which you can fasten your tripod head and camcorder. 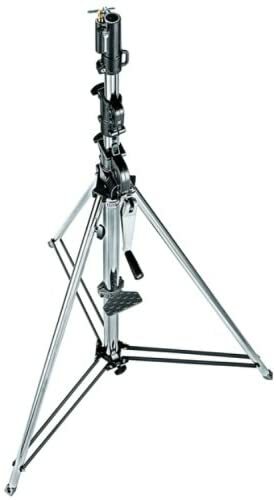 Two adjustable brackets are supplied for supporting the ladder, plus a claw ball leveller, enabling one of the brackets to be attached to your tripod. 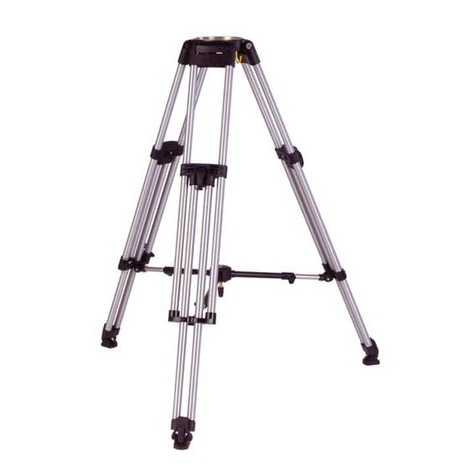 As the ladder is above the ground tracking shots can be achieved over any terrain without the need for laying tracks on the ground. 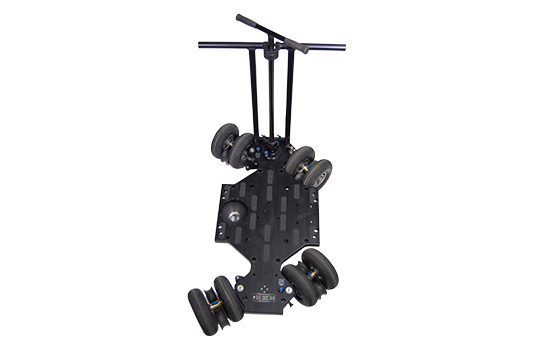 The dolly is fully adjustable for the different widths of ladders and the 8 radial ball bearing wheels, one of which has a brake, enable the dolly to be moved with ease. 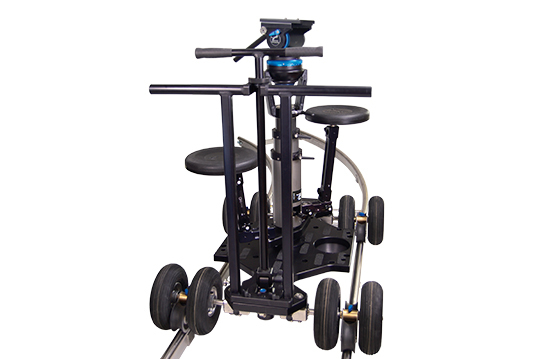 The Panther Twister Dolly provides whole new possibilities in agility, versatility and thus in speed of operation. 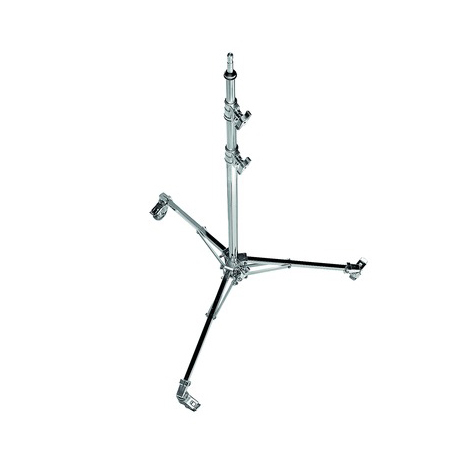 Length: 116 cm / 3.10"
Platform Height: 19,5 cm / 7.68"
Gauge (with disengaged wheels): 86,6 cm / 2.10"
Gauge (with engaged wheels): 78,6 cm / 2.7"
Inner steering radius (4-wheel-steering): 42 cm / 1.6"
Outer steering radius (4-wheel-steering): 116 cm / 3.10"
The lens is both sharp, and has a nice character well suited for modern digital S35 cameras. 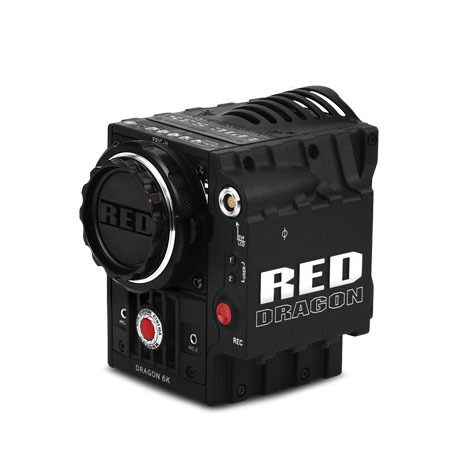 The Red Pro Primes are amongst the most modern and sharpest primes available. 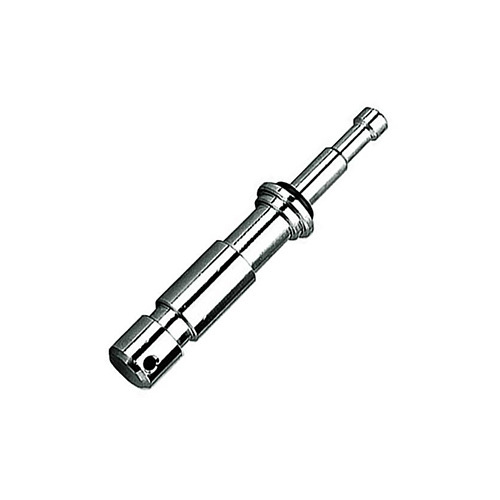 Chimera’s Daylite Series Banks stand up to high temperatures and long days. 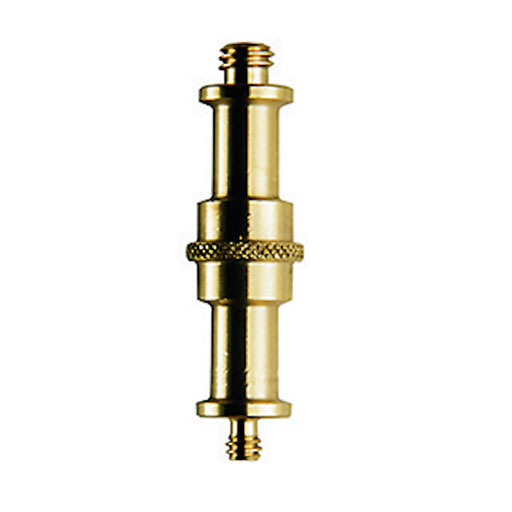 Chimera has a reputation for high quality, superior craftsmanship and innovative lighting solutions. 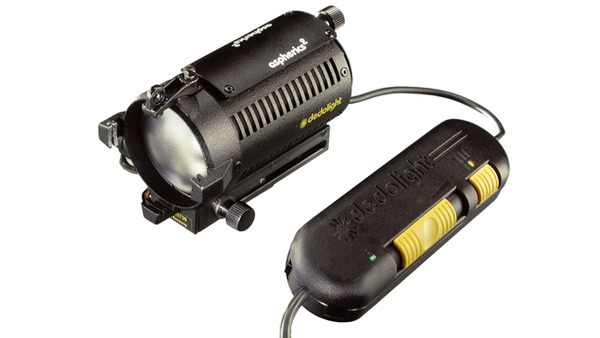 Daylite Series Banks have a deep design that’s ideal for use with a range of narrow beam Fresnel lights—an exclusive innovation from Chimera! 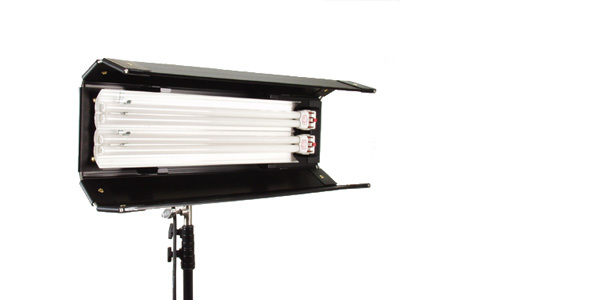 The increased depth allows light to fill the front diffusion screen evenly and increase the output of your light. 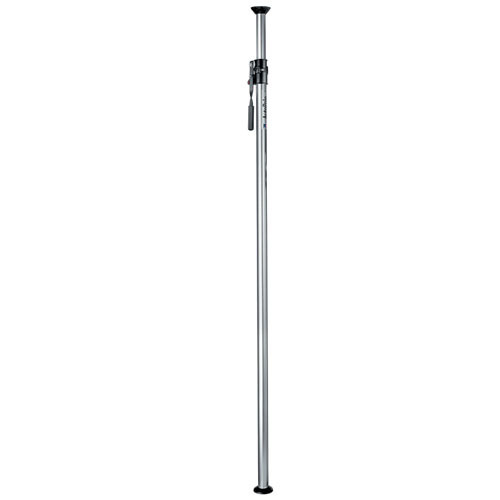 Daylite Junior Bank - Plus 3 are built to handle the heat from instruments up to 1000 watts. 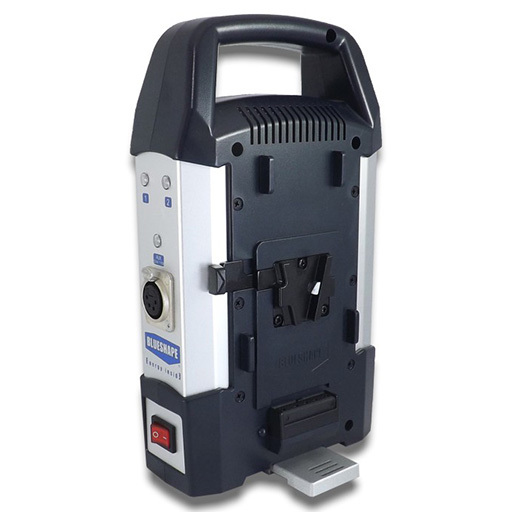 Daylite Standard Bank - Plus 3 are built to handle the heat from instruments up to 4000 watts. 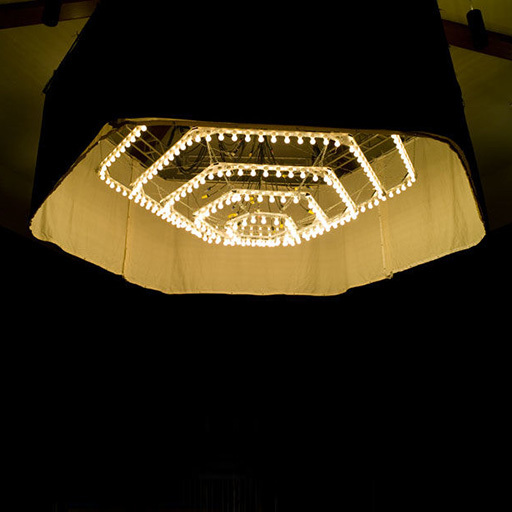 Chimera Pancake Lanterns features a flat-top design that allows the lightbank to be placed higher and closer to the ceiling. 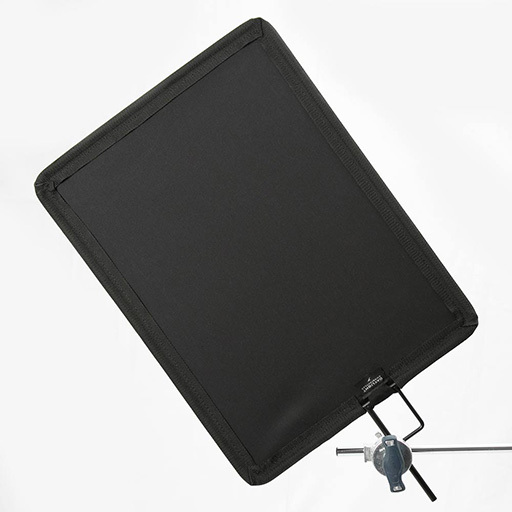 This maximizes placement options as well as limiting unwanted overhead bounce from the ceiling. 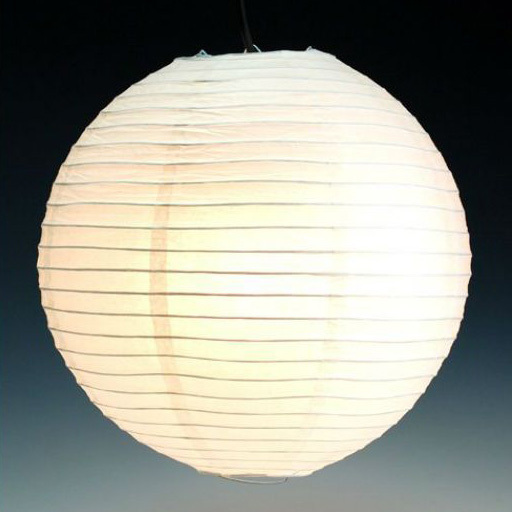 Chimera Standard Lanterns are a durable alternative to a traditional paper ball or "China Ball" lantern. 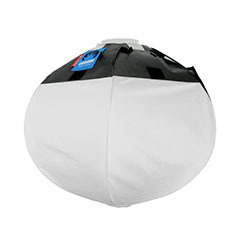 With a 360-degree full-diffusion body, standard lanterns are almost completely spherical, allowing for an omnidirectional soft light. 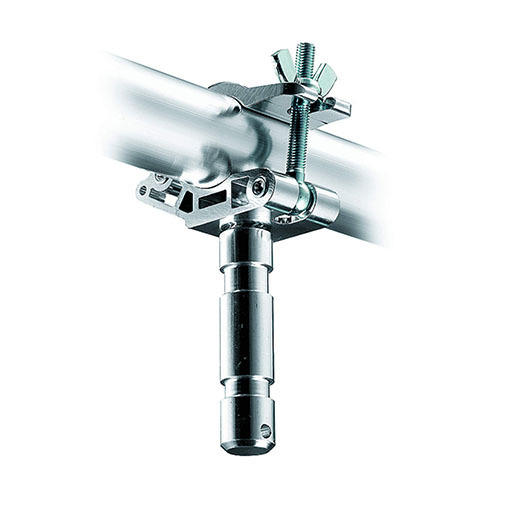 High-Heat materials for use with continuous fixtures. 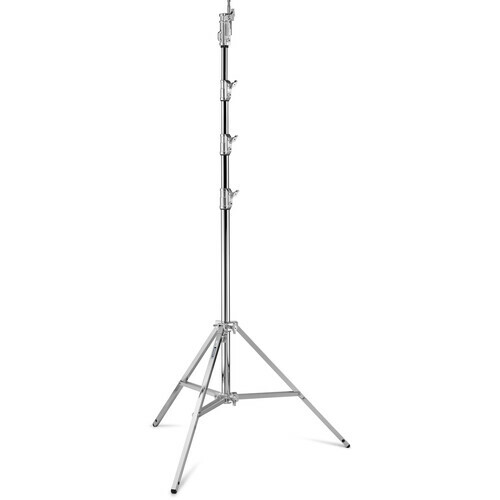 Skirt for Standard Lantern - 20"
Skirt for Standard Lantern - 30"
Chimera Triolet is the ultimate multi-tool lighting fixture. 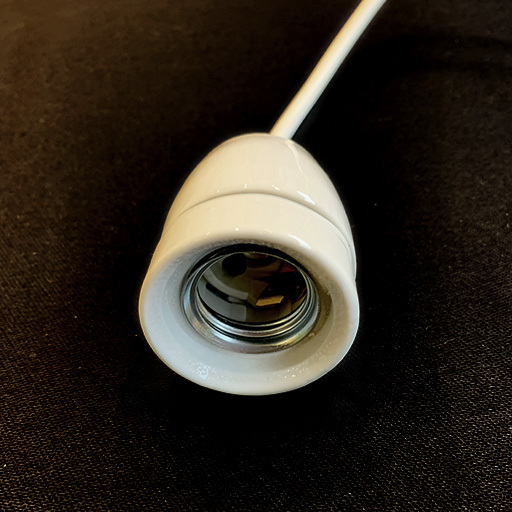 Designed as a compact, versatile, continuous lighting problem-solver, the Triolet features all-metal construction and an attached cord with inline switch. Daylight conversion filter. 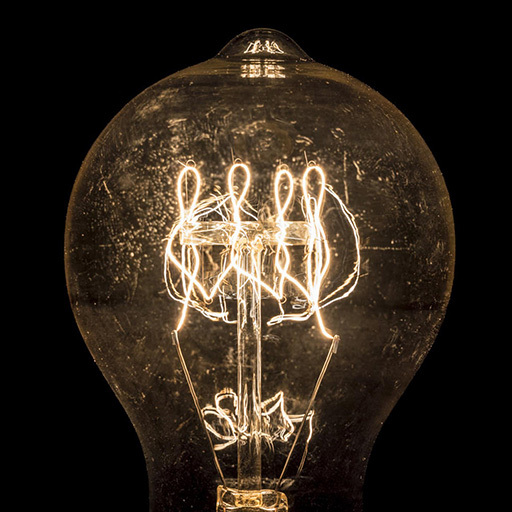 Light loss, 1 Stop. 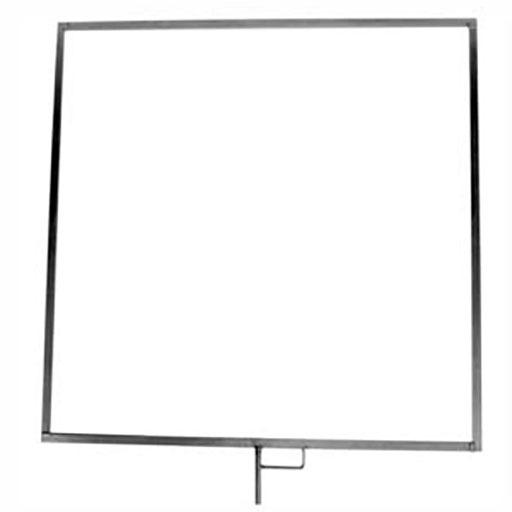 Take a look at the product sheet for more information. 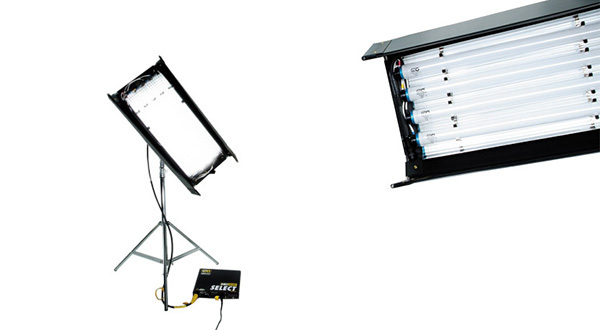 The award-winning 4Bank portable lighting systems have changed the way professionals light everything from feature films to television productions to video and still photography. 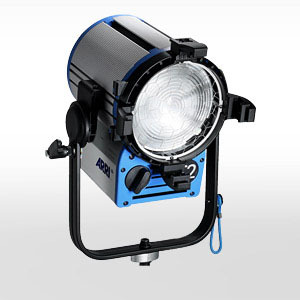 The 4Bank System was designed as a softlight source that could be plugged into the wall on location. 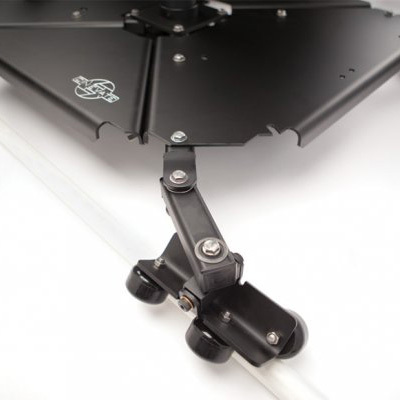 Mounting Plate, Ballast and Extension Cable. 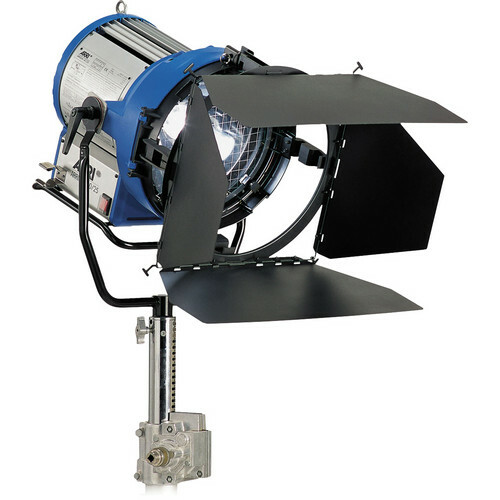 It was designed in this manner to allow the greatest flexibility when working on film production where the gaffer and DP are constantly being challenged to light unique locations and problem solve at a moment's notice. 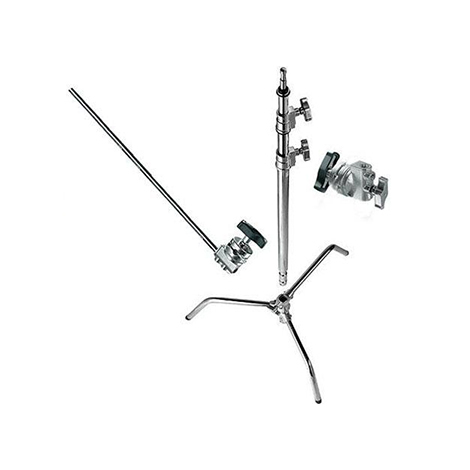 most versatile product in the Kino Flo product range and was the first product developed by Kino Flo more than 25 years ago. 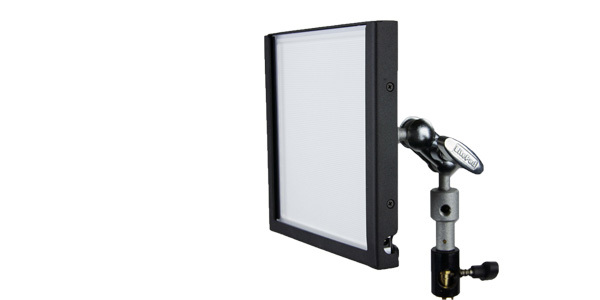 BarFly Fixture w/3.6m head extension, Mounting Plate and Ballast. 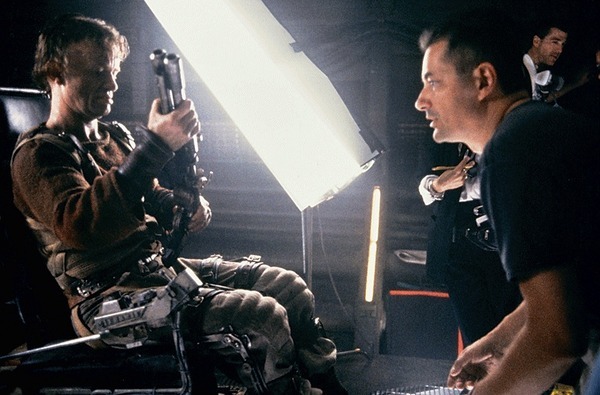 gaffer and DP are constantly being challenged to light unique locations and problem solve at a moment's notice. 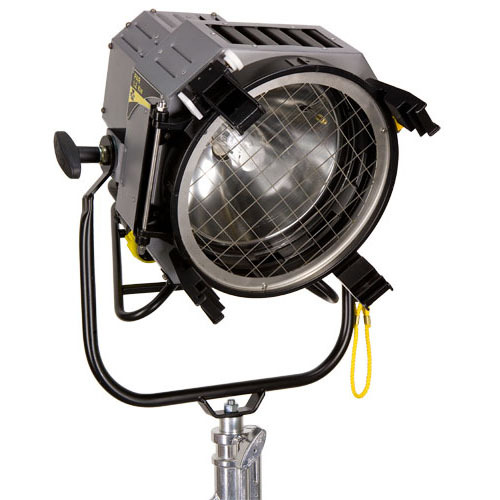 three point lighting kit to complement such popular location lighting instruments as the Kino Flo Diva-Lites. 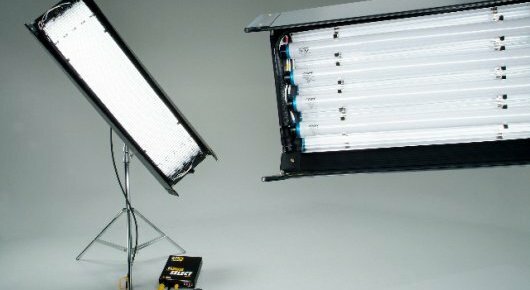 The Portable Diva-Lite® series have become the industry’s most popular professional cool lighting fixtures for video location work. 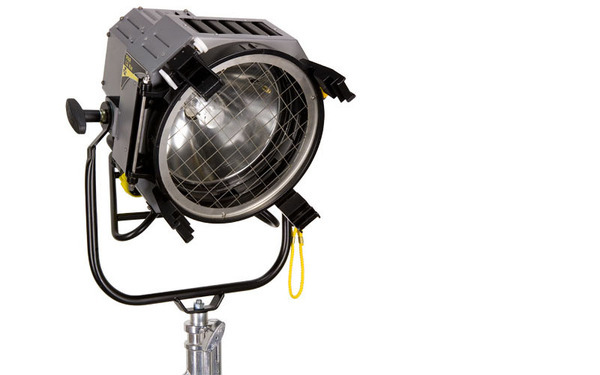 The Diva-Lite 200 portable softlights boast the company’s trademark modular fixture designs with full-range dimming, switching and remote control features. 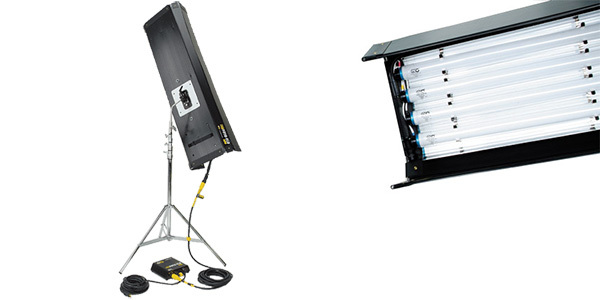 Diva-Lite 200 fixtures are portable, versatile units designed for the rigors of run and gun lighting for news or commercial video production. 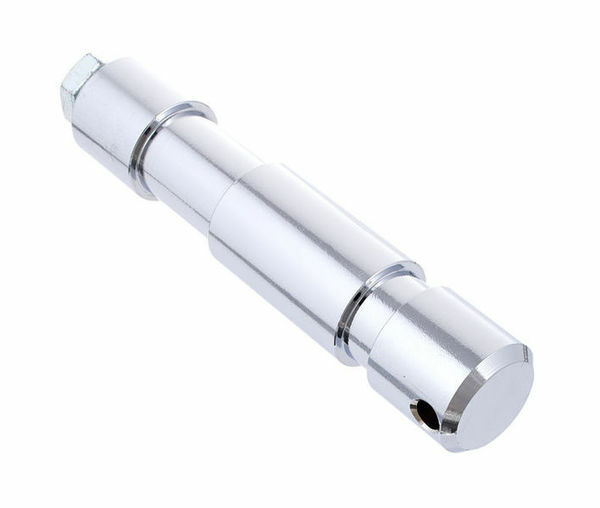 All Diva-Lites can go from nighttime to daytime interiors by switching True Match® tungsten for daylight quality lamps. It’s like having two set-ups in one! 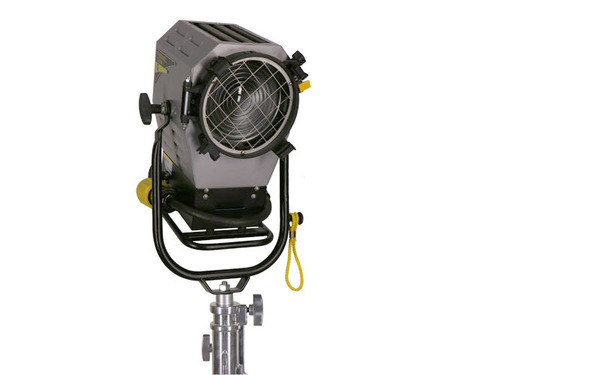 The Portable Diva-Lite® series have become the industry’s most popular professional cool lighting fixtures for video location work. 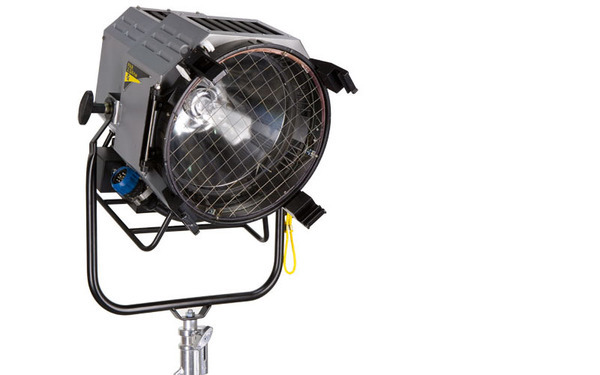 The Diva-Lite 400 portable softlights boast the company’s trademark modular fixture designs with full-range dimming, switching and remote control features. 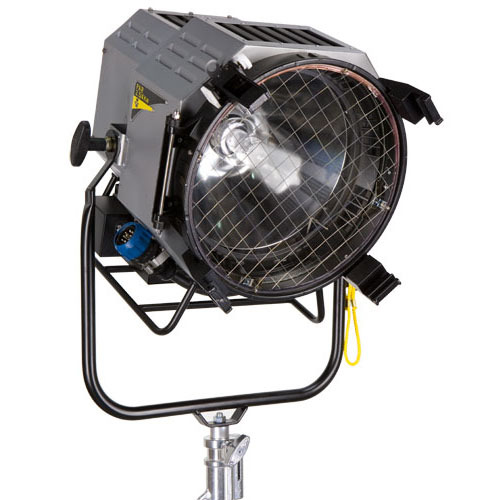 Diva-Lite 400 fixtures are portable, versatile units designed for the rigors of run and gun lighting for news or commercial video production. 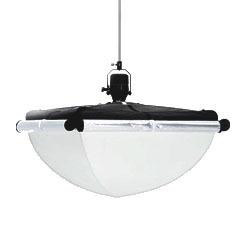 All Diva-Lites can go from nighttime to daytime interiors by switching True Match® tungsten for daylight quality lamps. It’s like having two set-ups in one! 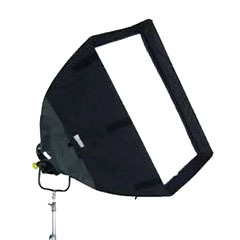 The Kino Flo Foto-Flo 400 is a trim, lightweight unit versatile enough to work as a soft, flattering key light for fashion photography, film and video work. 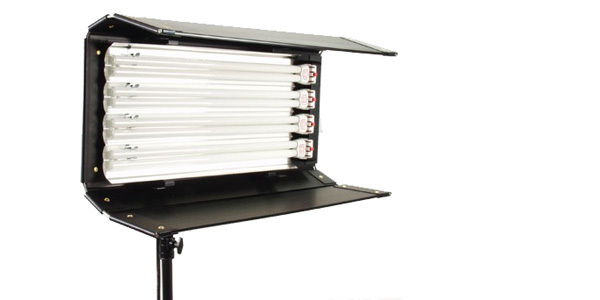 Although uniquely soft, the Foto-Flo 400 can be controlled with removable louvers and built-in barndoors. 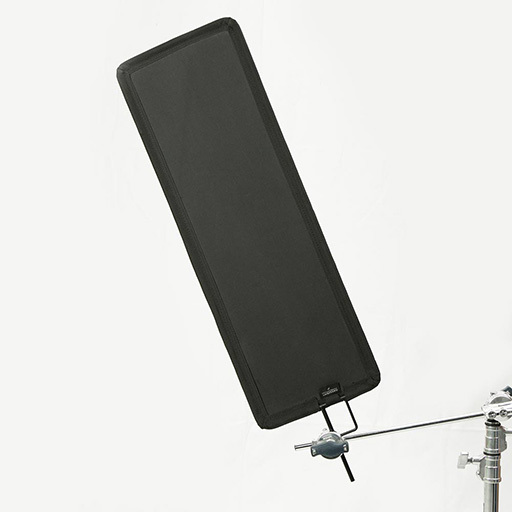 The broad, even beam makes it a popular choice for lighting chroma key walls, table top subjects and dura trans images. 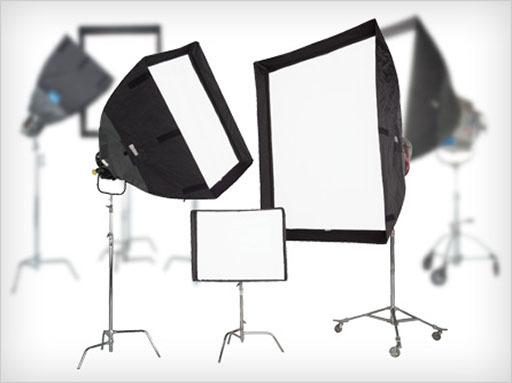 For special shots, the lamps may be operated outside the fixture, taped under desks, or laid behind a stack of books. 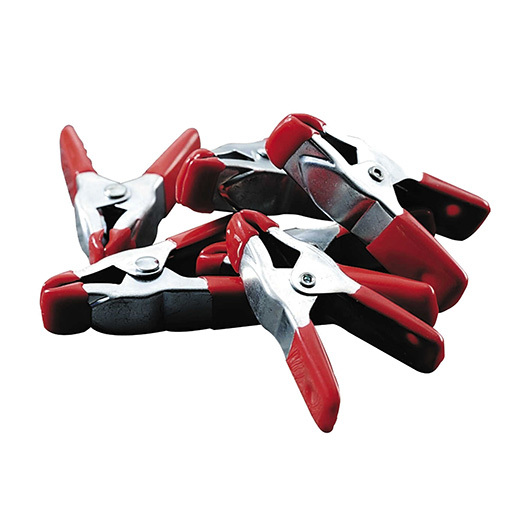 They are cool, so they can work close to the subject without fear of excessive heat. 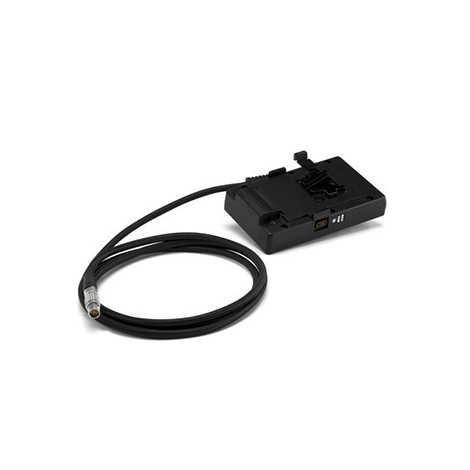 The compact Foto-Flo 400 Ballast either mounts on the fixture or remotely connecting with the head extension cable. 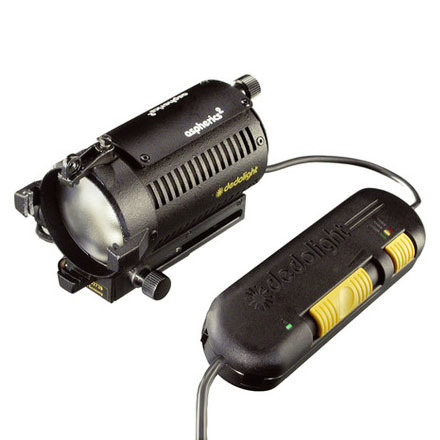 The Rembrandt Daylight Compact Fresnel fixtures are the brightest Fresnel and offer the widest beam in the industry. 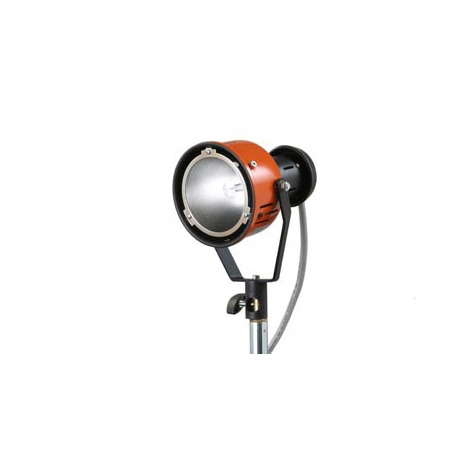 The outstanding optical output and superior barndoor control offer high quality modeling light for Lighting Professionals. 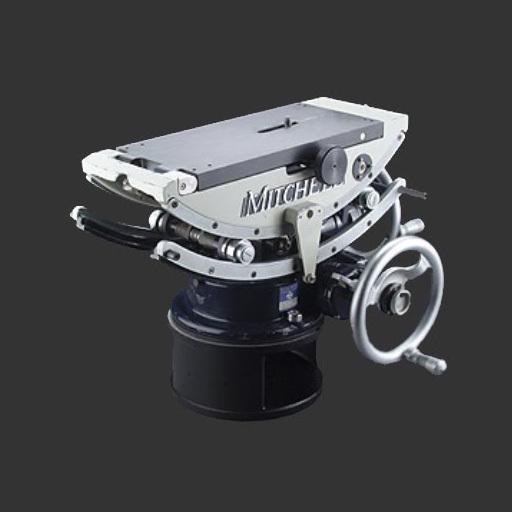 The compact, stainless steel construction allows the Rembrandt to lightweight and be durable compared to most conventional Fresnels. 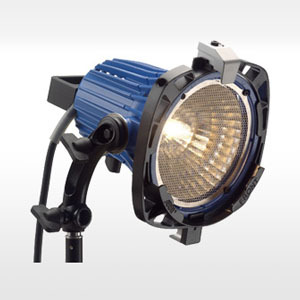 The Remington Daylight Pars are the brightest, most versatile, PAR Systems in the industry. 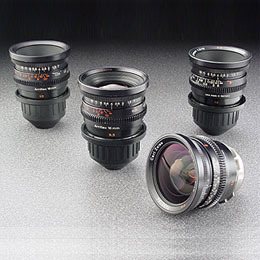 The Five optical lens system ranges from Narrow to Extra Wide lens and includes a Frosted Fresnel lens for wide, even coverage. 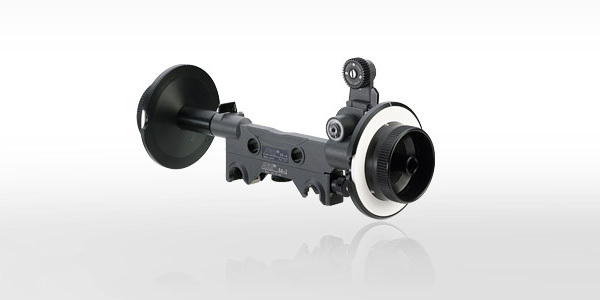 The powerful output from the reflector and unique focus system combined with the drop in lenses, makes the Remington Pars the most flexible systems in the market. 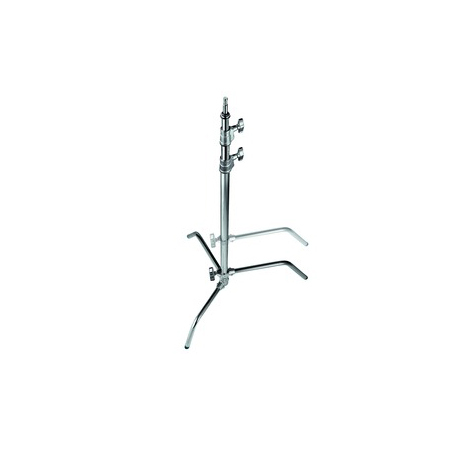 The stainless steel, modular construction, adds to the durability and reliability of the fixture for all location, ENG and outdoor productions. 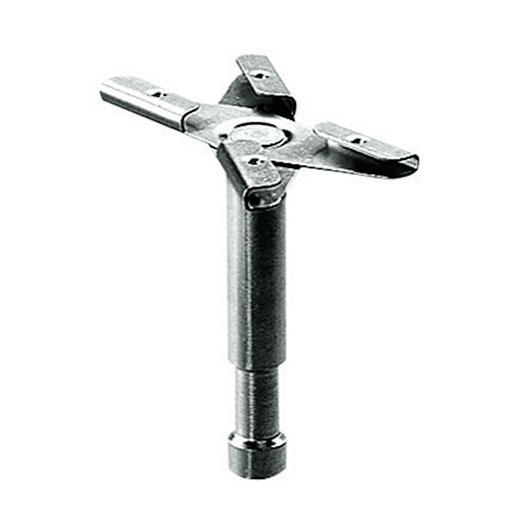 Rugged stainless steel construction. 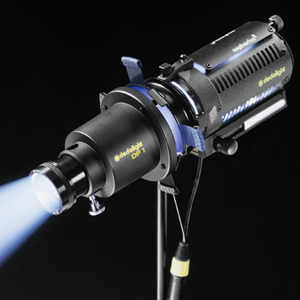 We also make custom light rigs. 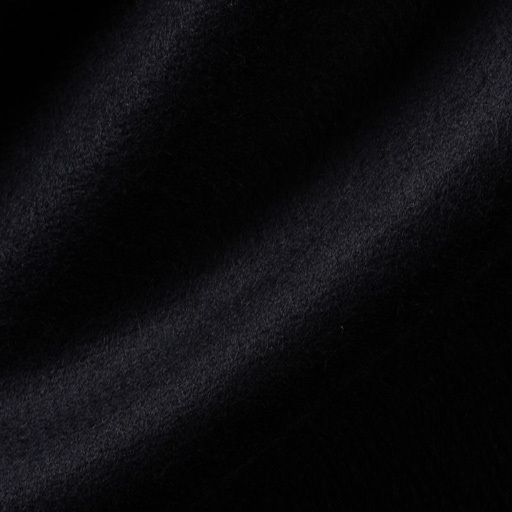 Please do not hesitate to contact us if you need something tailor made. 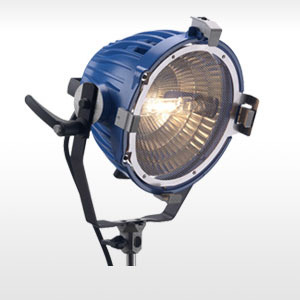 This Felloni Techpro 15° Standard Bicolor LED Light runs on 324 LEDs and has a spot beam angle which makes it ideal for longer throw applications or situations requiring higher output. 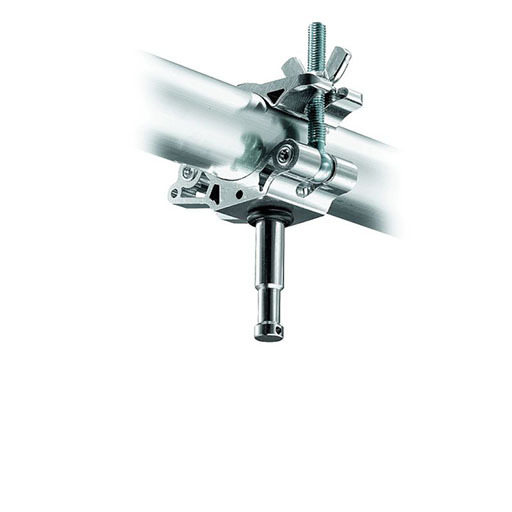 The narrow beam angle is also perfect for controlling spill light and for edge or side lighting purposes. 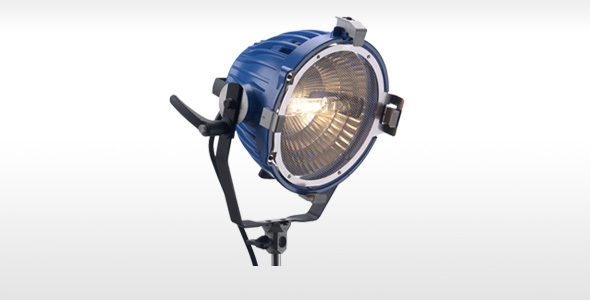 The bicolor LEDs are variable in fine steps from 3200 - 5600K covering the tungsten to daylight balance range. 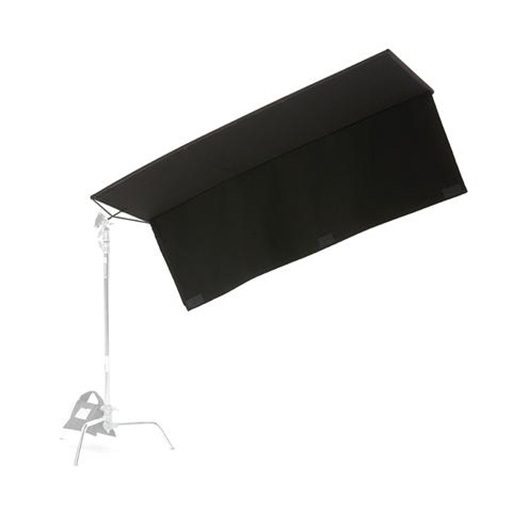 This is the perfect light when speedy setup is of paramount importance. 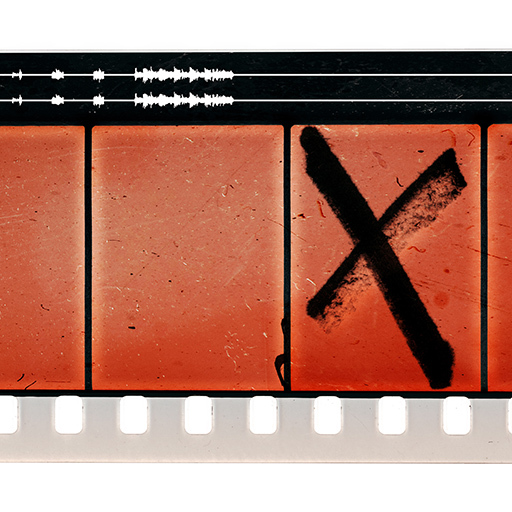 You can forget about fumbling with gels and gaffer's tape and just start shooting. 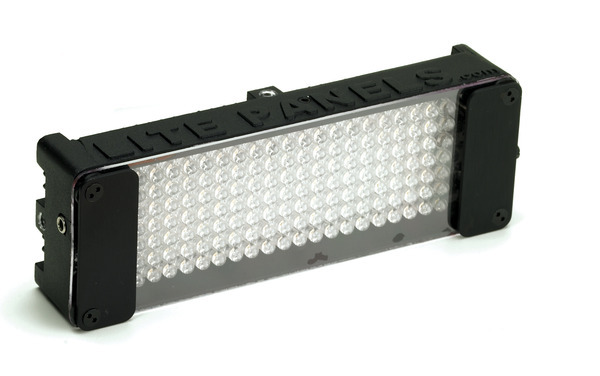 The 1 x 1', 4.4 lb panel is virtually heat-free, so you can squeeze it into places where other lights just can't go without worrying about harming the talent. 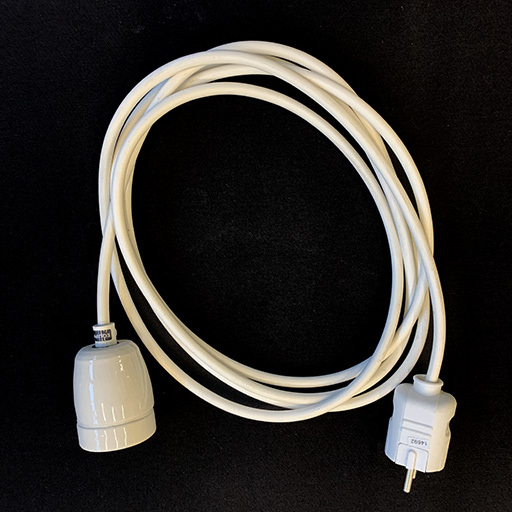 - The standard (on board) dimmer module is detachable and attached to an 8' (2.5 m) cable, may be used as a remote wired hand dimmer. 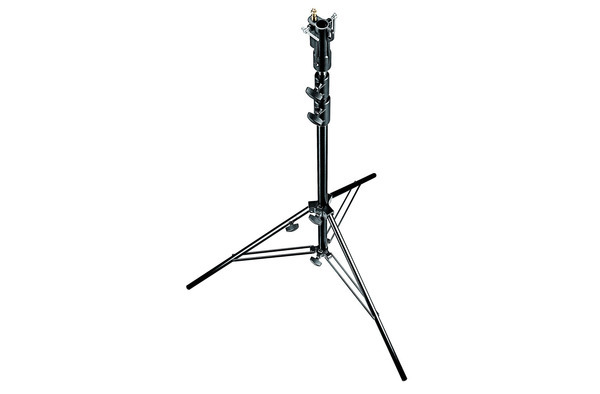 The base plate allows the MiniPlus to be fully free standing, with easy pan and tilt adjustment. 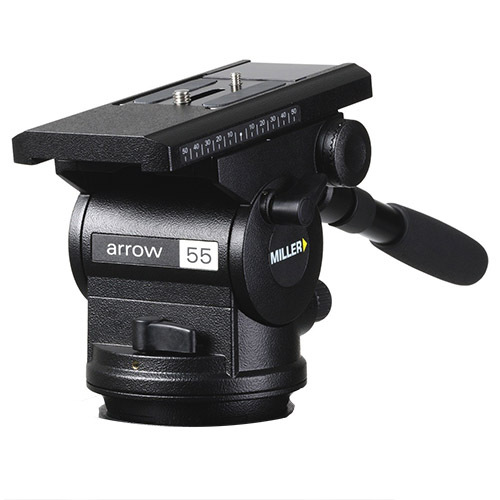 The Deluxe Detachable Ball Mount with integrated hot shoe allows for multiple configurations—on the base plate, camera hotshoe, or with other types of mounting hardware. 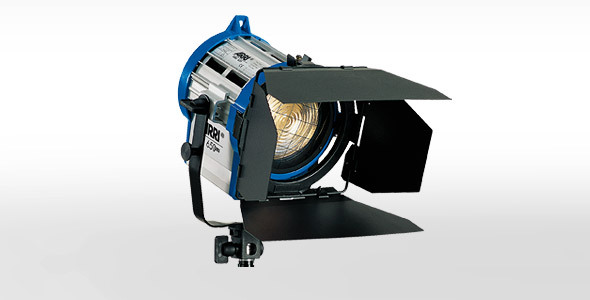 The ARRI Fresnel series is ideal for use where compact, lightweight tungsten Fresnel spotlights are required, especially in small studios where grid height is a problem or on location. 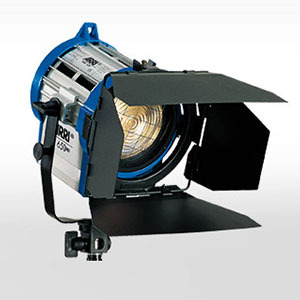 Classic ARRI construction, using corrosion-resistant, extruded, die cast aluminium, maximises body strength while maintaining the light weight of a location fixture. 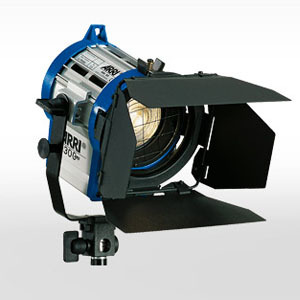 Despite the small size of ARRI Fresnels, their short focal length, wide angle lenses produce impressive light output and good light distribution over the full beam area. 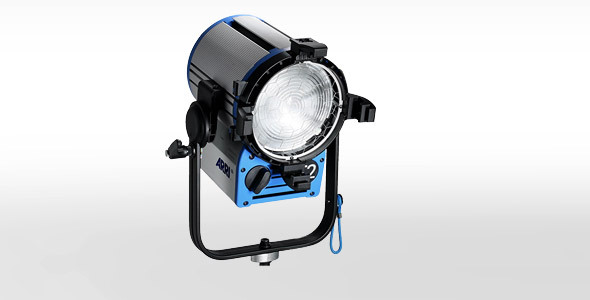 The ARRI Fresnel series is ideal for use where compact, lightweight tungsten Fresnel spotlights are required, especially in small studios where grid height is a problem or on location. 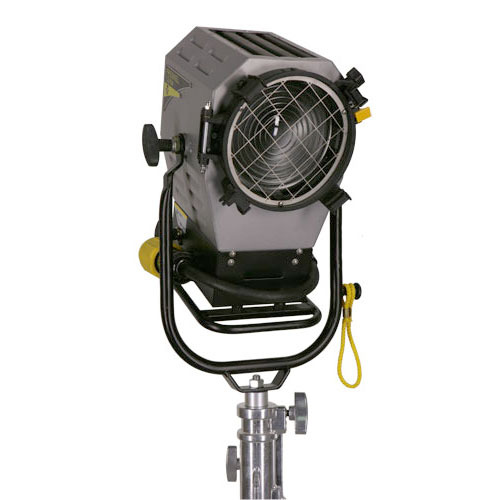 Classic ARRI construction, using corrosion-resistant, extruded, die cast aluminium, maximises body strength while maintaining the light weight of a location fixture. 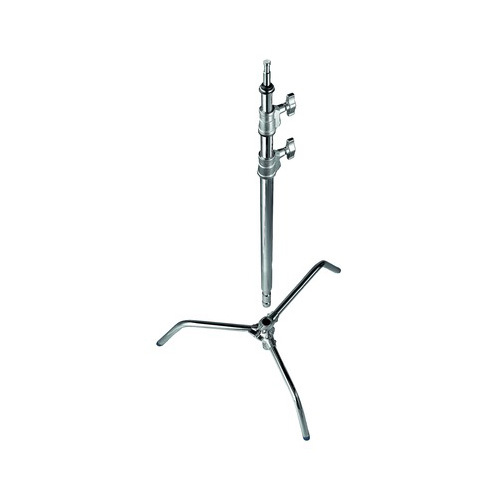 ARRILITE Plus 2000 is a new redesign and update of the traditional ARRILITE 2000 open-faced lamphead. 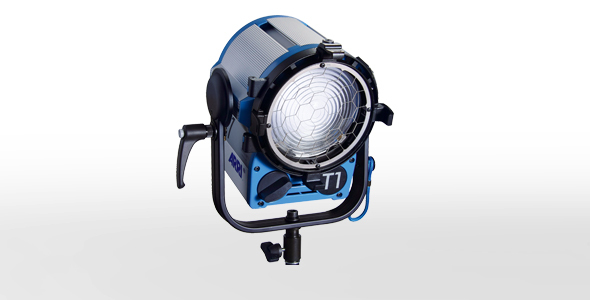 Incorporating a range of innovative features, the new ARRILITE 2000 Plus meets the exacting production demands of today’s film and television industries. 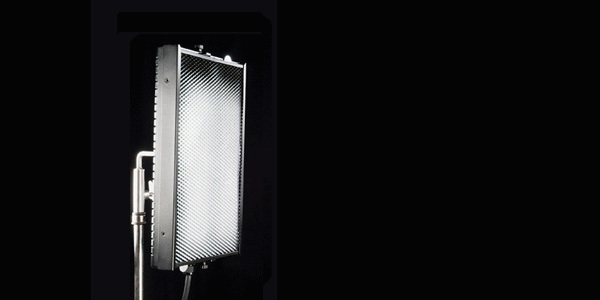 By utilizing the ARRIMAX reflector and optical system, light efficiency is increased and light distribution improved. 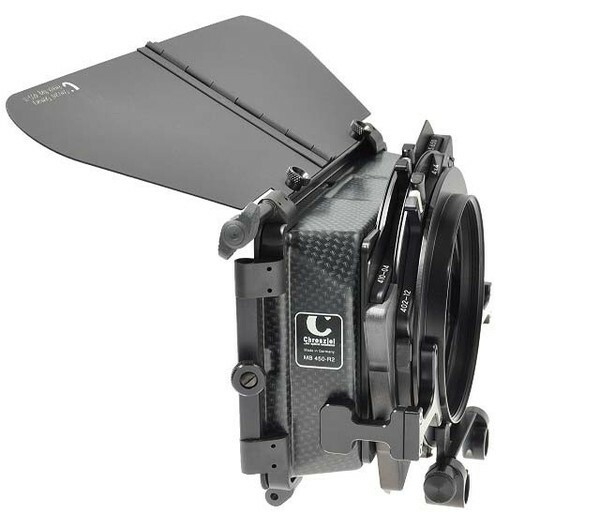 The aluminum housing is more compact and about 400 g lighter than the previous model, while disc brake technology borrowed from the ARRI True Blue range holds the ARRILITE 2000 Plus steady even with heavy accessories attached. 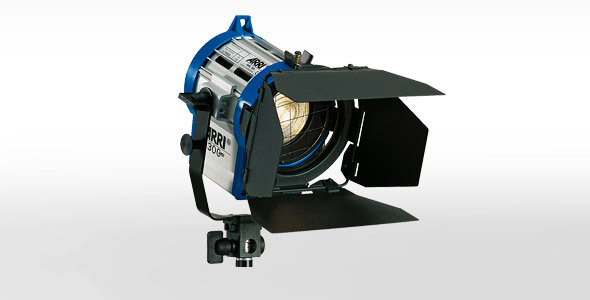 In order to change bulbs, the front door frame opens in a similar way to the ARRI M18; no screws have to be removed and no tools of any kind are needed. 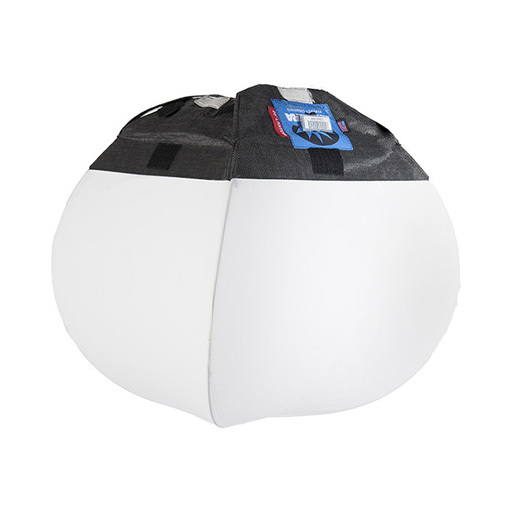 Like the ARRILITE 750 Plus, the 2000 Plus features an improved focus mechanism and heat-proof handle at the rear of the housing that facilitates easy maneuvering. 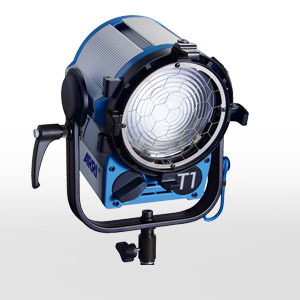 The ARRILITE 750 Plus is a new and improved incarnation of ARRI’s traditional, open-faced light, the ARRILITE 800/1000. 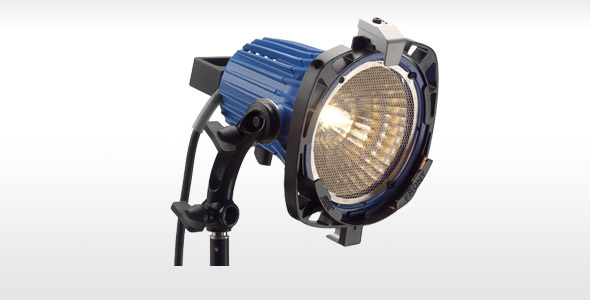 By optimizing the ARRIMAX reflector for usage with an HPL 750W lamp, the ARRILITE 750 Plus offers 21% higher light efficiency than the previous ARRILITE 800W, while the ARRIMAX optical system improves distribution of the light. 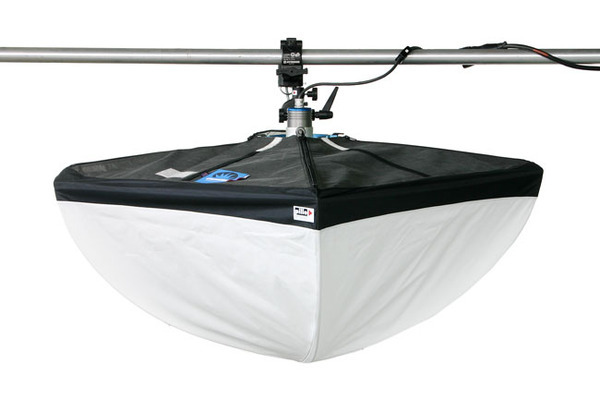 A detachable and fully rotatable accessory holder accommodates scrims and barndoors, and incorporates fittings that permit the Chimera Video Pro Plus S to be fitted directly, without an additional speedring. 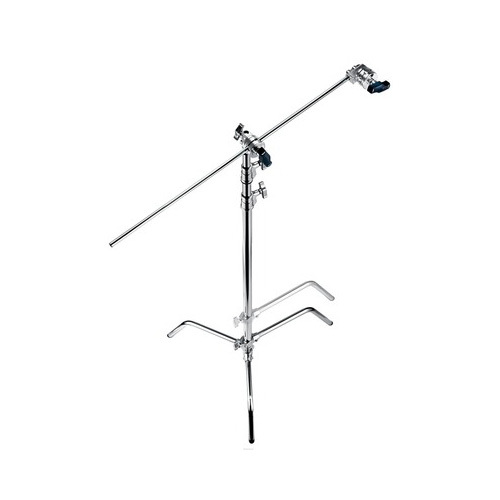 The one-arm stirrup allows for plenty of pan-and-tilt options and a heat-proof handle at the rear of the lamphead enables easy maneuvering. 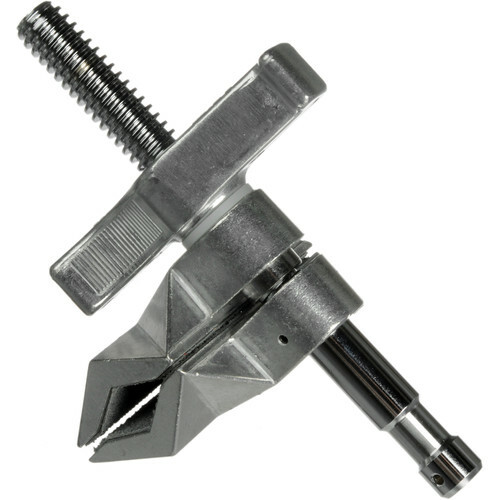 No tools are required for changing bulbs as the housing consists simply of two detachable parts that open and close through bayonet cap locks. 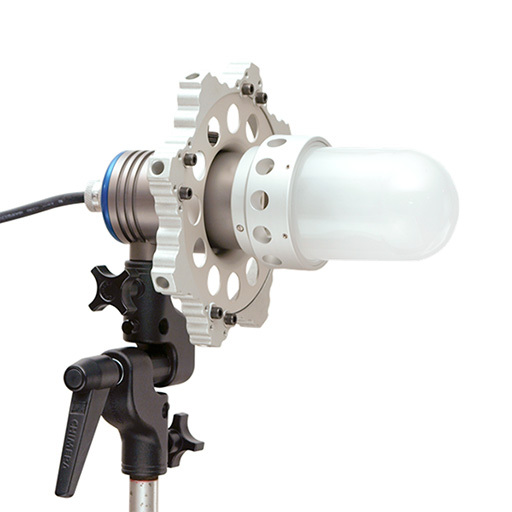 The smaller and lighter aluminum housing of the ARRILITE 750 Plus makes it an ideal lamphead for lighting kits and therefore also suitable for electronic newsgathering, field production and fast turnaround location use. A small and polite Redhead. 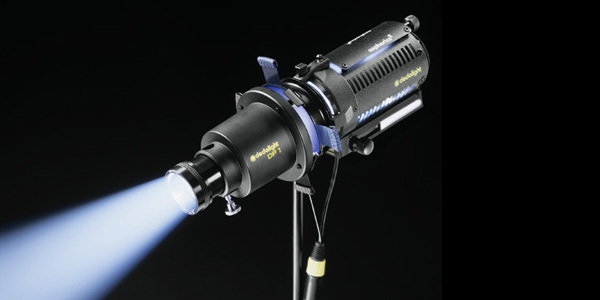 The lilleput is also an efficent little thing, it can either run 300 or 650 watt bulbs. 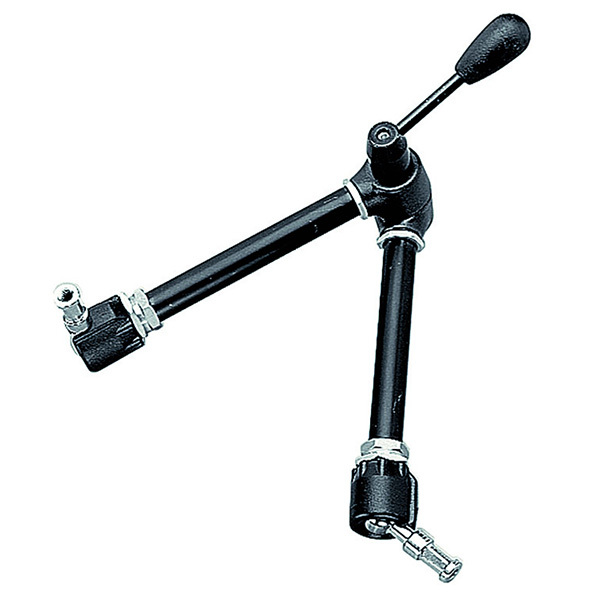 The Avenger D300 Articulated Arm with Spring Clamp is a multi-ball jointed grip arm. 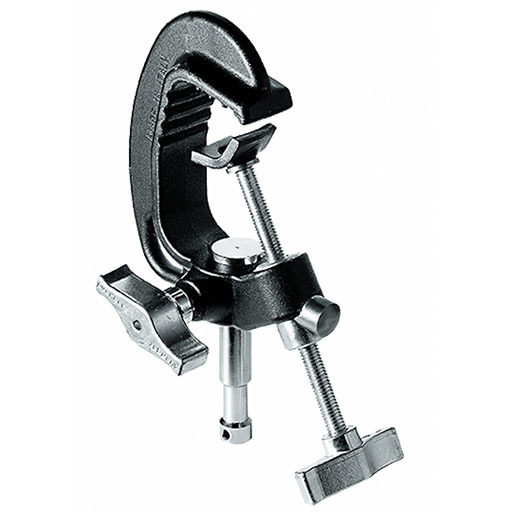 It mounts to a 5/8" light stand or grip stud. 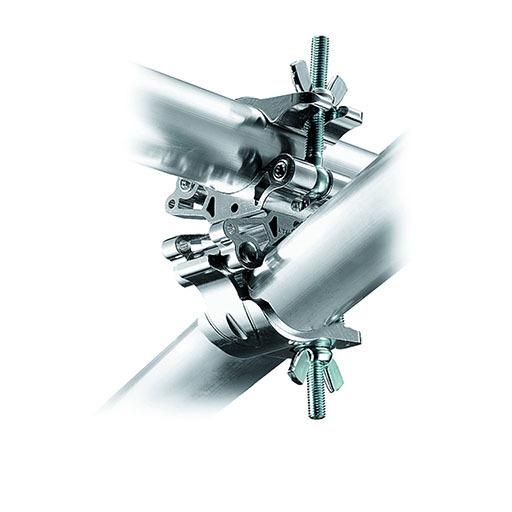 Each joint loosens each section independently, for precise control. 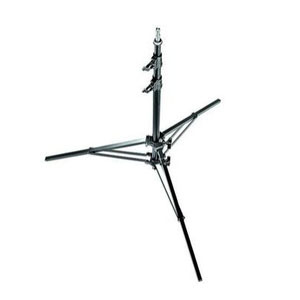 It terminates with a heavy duty spring clamp that can hold a gobo, reflector, prop or flag. 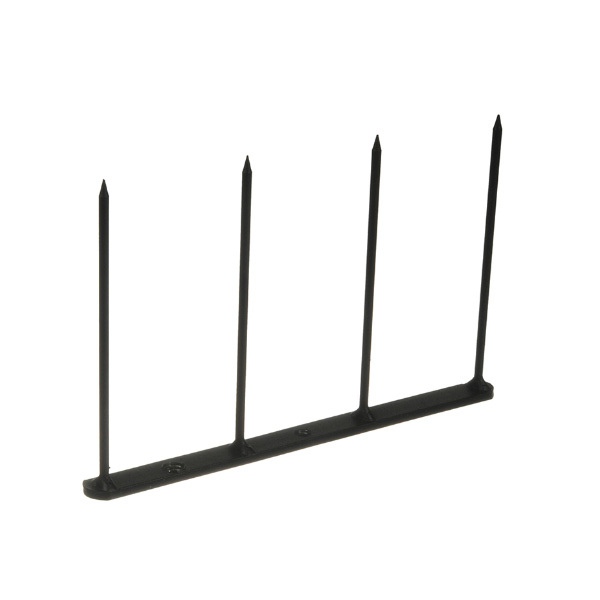 Forged steel with trapezoidal screw. 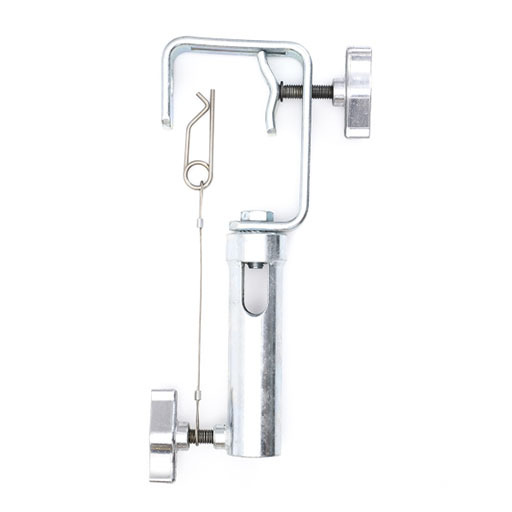 The C338 Quick Action Baby Clamp with 5/8" Pin from Avenger is a heavy-duty support for hanging light fixtures from rails, grid pipes, or other supports. 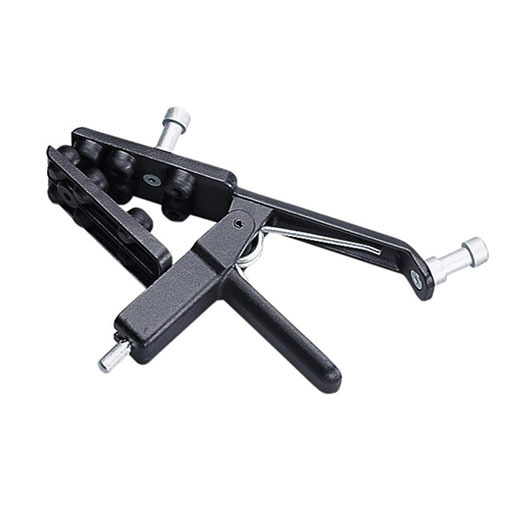 The aluminum clamp features a standard 5/8" baby stud for lightweight lumanaries and an impressive load capacity of 50 kg (110 lb). 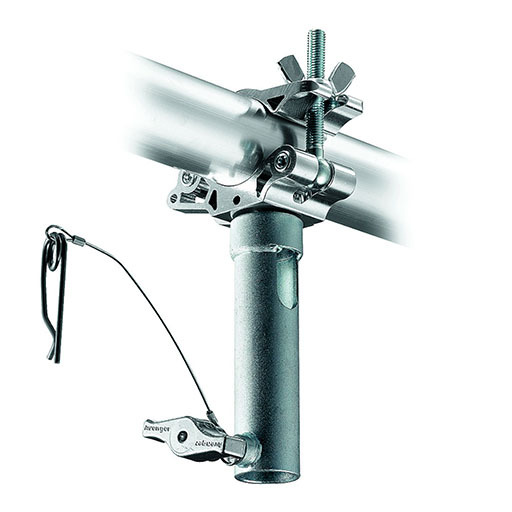 In order to meet all safety requirements the clamp has also been designed with a dedicated slot for flexible steel safety cables. 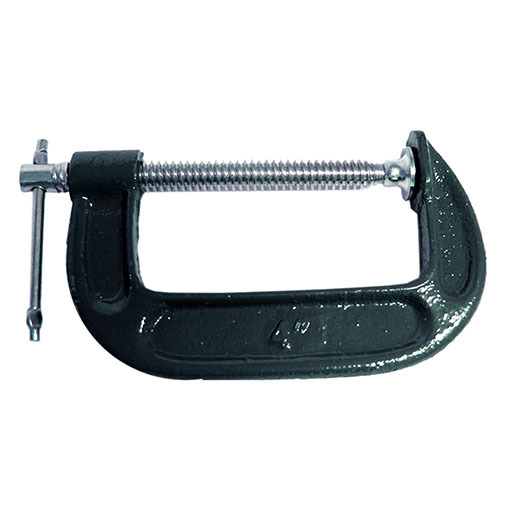 Providing strong, solid gripping of round, square, or rectangular tubing and many other common and irregular shapes. 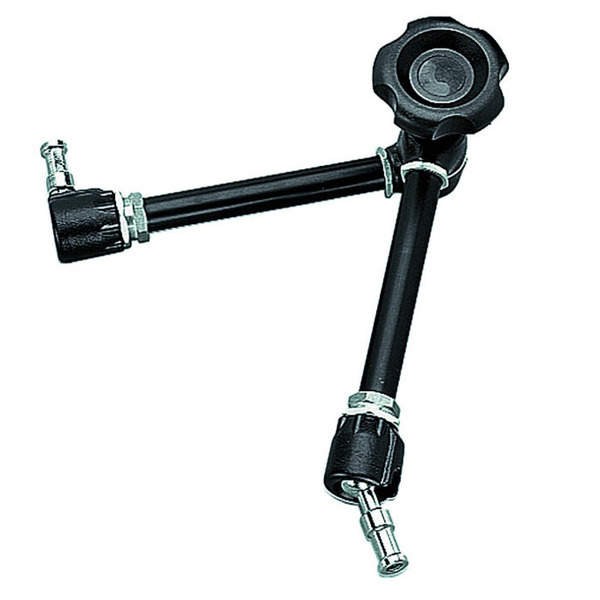 Magic Arm with bracket for mounting cameras and other equipment with camera bracket. 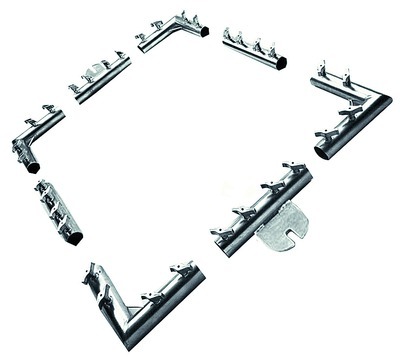 This kit, which contain corners and supports, gives you the possibility of making frames of 12x12 feet or 3.65 x 3.65 meter dimension, using standard aluminium pipes. 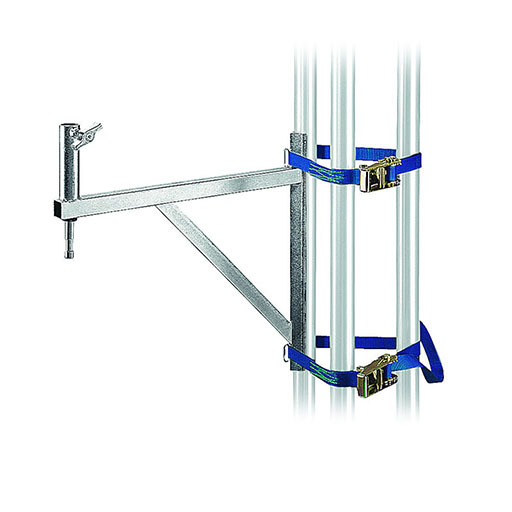 This kit, which contain corners and supports, gives you the possibility of making frames of 20x20 or 6.1 x 6.1 meter dimension, using standard aluminium pipes. 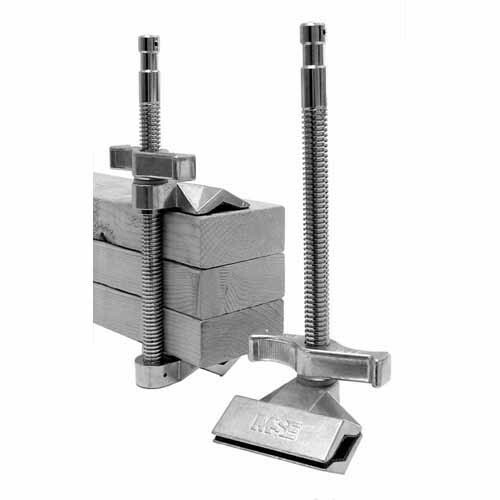 This kit, which contain corners and supports, gives you the possibility of making frames of 8x8 or 2.44 x 2.44 meter dimension, using standard aluminium pipes. 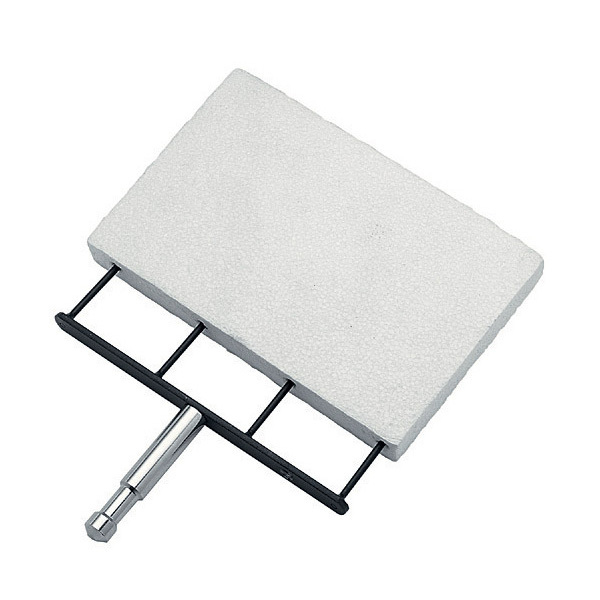 A foamcore support clamp to enable precise positioning with four pointed pins to mount thicker foam core or gator-board. 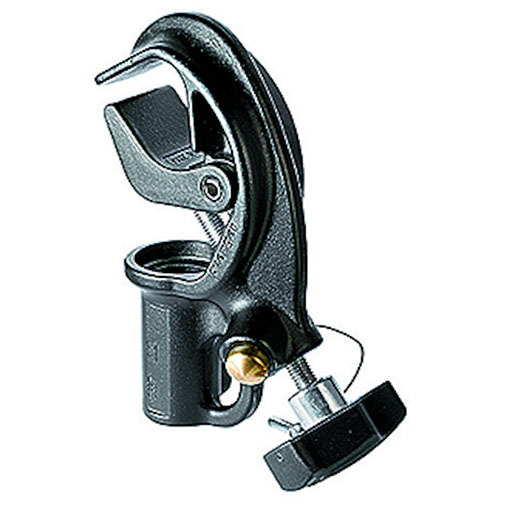 Mounts with a Magic Arm. 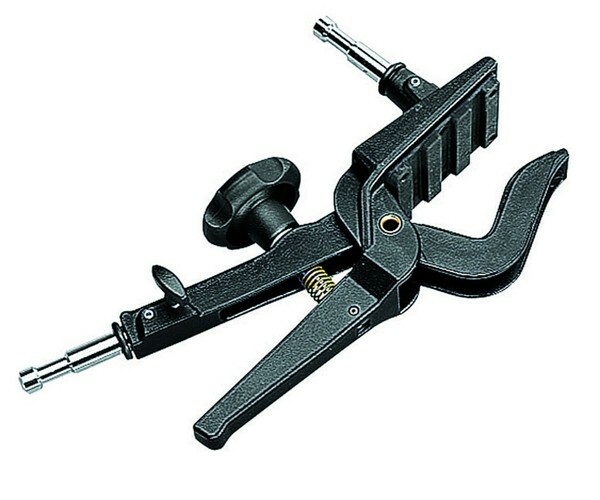 A foamcore support clamp to enable precise positioning with four pointed pins to mount thicker foam core or gator-board. 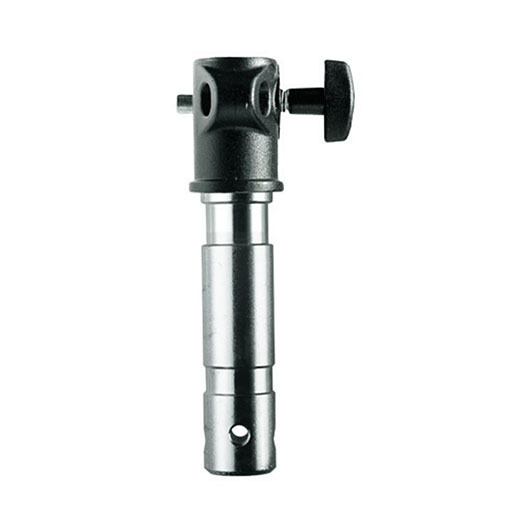 Mounts via a 16mm socket. 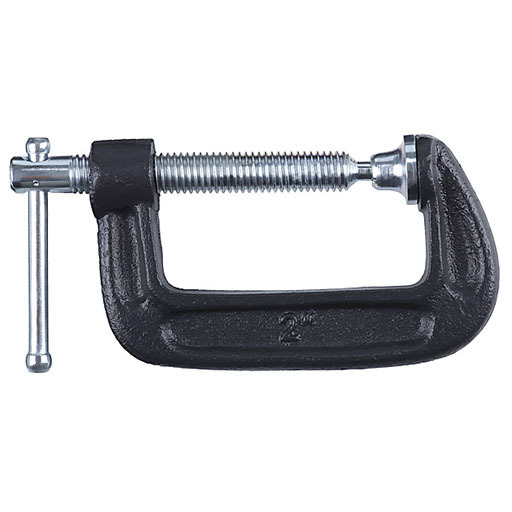 Normally used in combination with a Grip head. 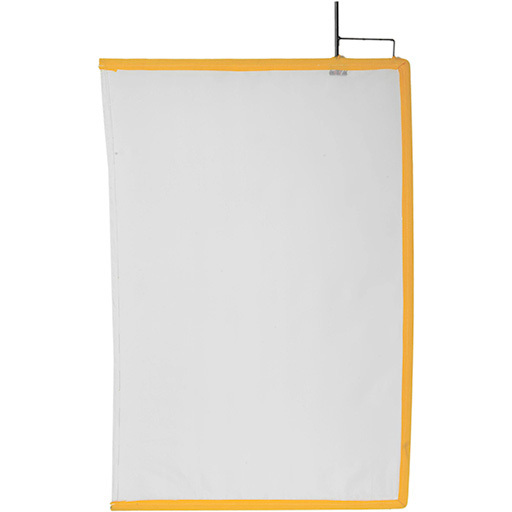 It provides an extended grip point for scrims and flags or small lights. With its strong joint it solves all positioning problems of scrim, flags or small lights. 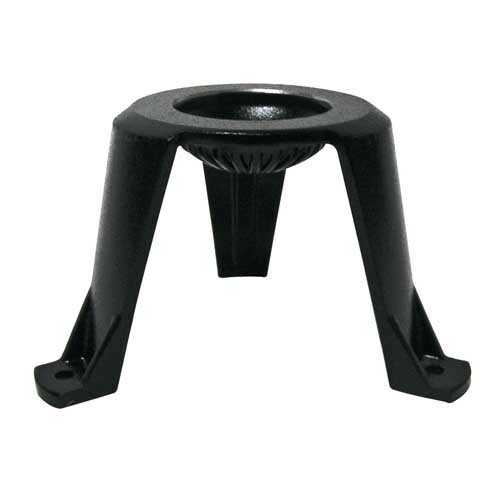 Avenger E200 Stand Adapter. 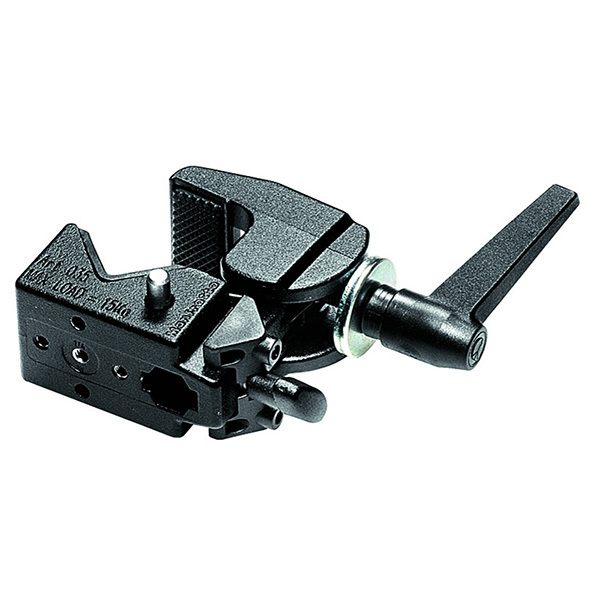 It fits into the Junior 1-1/8" female receiver on heavy duty light stands and grip clamps. 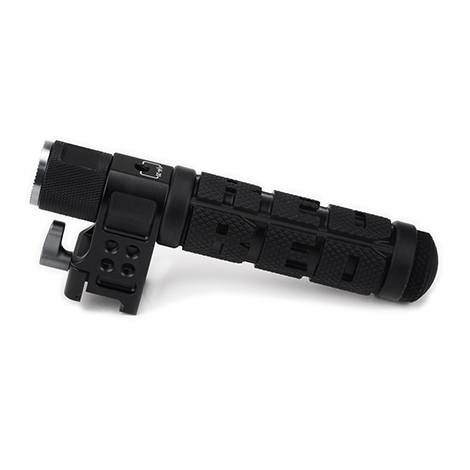 It allows to use lights and accessories with a Baby 5/8" receiver. 3 sections, 2 risers. 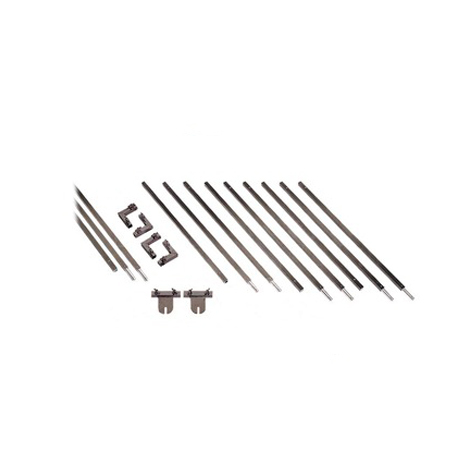 Ø: 35, 30, 25mm. 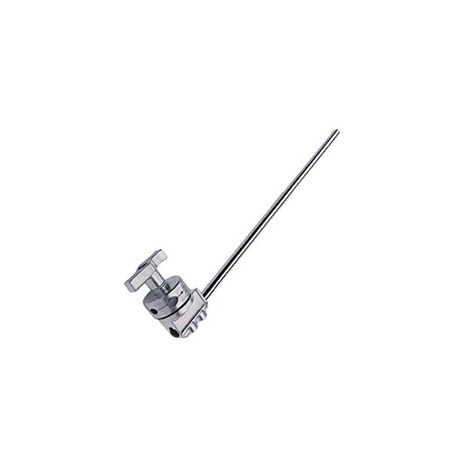 Attachement top: 16mm / 5/8"